Click on any of the above locations in blue to access the related post. N.B. The terms Ojibway, Ojibwe, and Chippewa all refer to the same First Nations culture belonging to the larger Algonquian-speaking people who know themselves as Anishinaabe. You will note a variety of spellings for all these names as you check out other sources! Selwyn Dewdney is the man most responsible for the systematic tracking down, recording, and analyzing the Anishinaabe pictographs of Ontario. 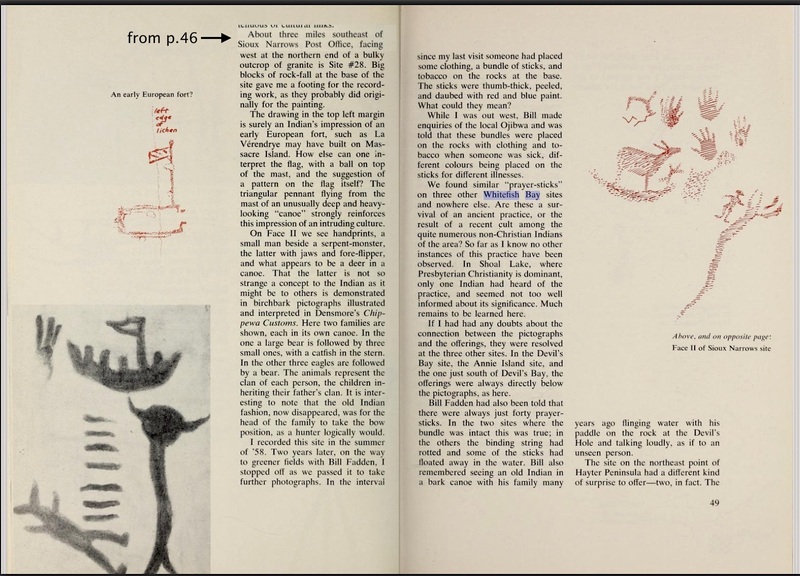 By 1967 and the second edition of his book Indian Rock Paintings of the Great Lakes he had recorded 264 different sites, many in Ontario with the most of the others in Manitoba and Minnesota. (See here for a pdf list of those 264 sites.) Click on the book title to see a copy of the 1962 first edition of the book, which the Royal Ontario Museum contributed to the digital Internet Archive in 2014. 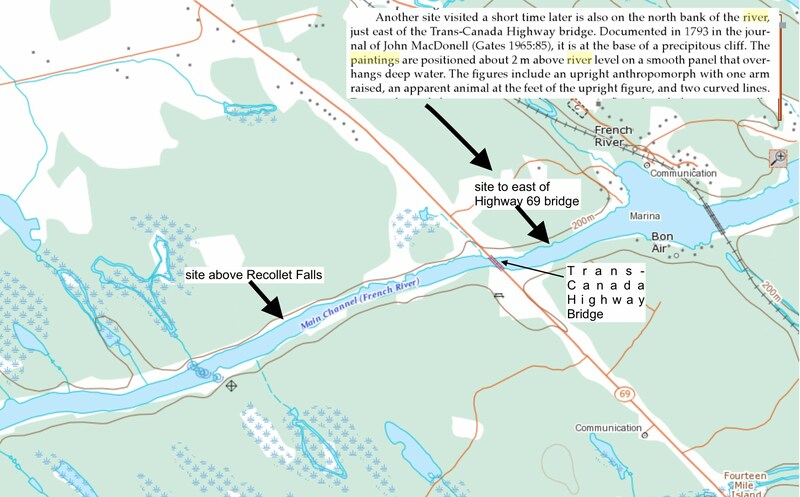 Since the first edition covers only the first 102 sites Dewdney visited, it does not include his return to the Bloodvein River system or his discovery of the Cliff Lake site on the Pikitigushi (formerly the Mud) River system. However, it is still a great introduction to his work. Hard copies of the book are difficult to come by so an easily available first edition is great news. Update: I’ve scanned the 57 pages of additional material from the 1967 second edition of the book. The 7 Mb pdf file can be accessed here. 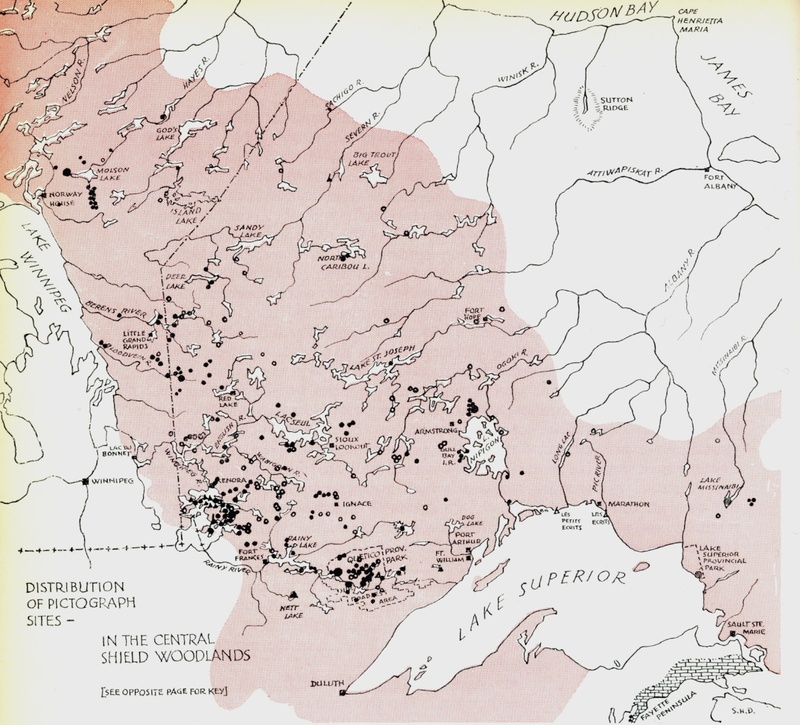 The following fifty-year-old Dewdney maps show clearly that the heart of Ontario pictograph country lies from Lake Nipigon to the Manitoba border, with Quetico and Lake of the Woods being the primary locations. 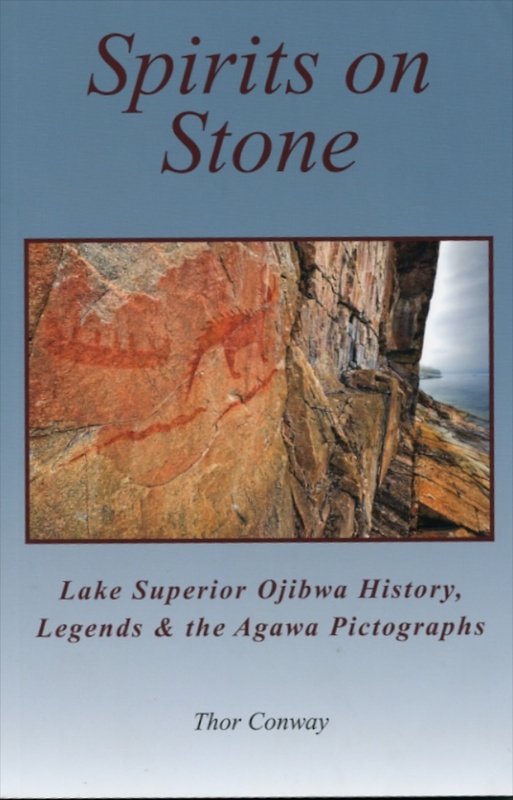 Another insightful introduction to Ojibwa pictographs in Ontario is the book whose cover is pictured here. In the 1970’s Thor Conway and his wife Julie began their study of traditional Ojibwa culture, and specifically the rock paintings found in the Ontario part of the boreal Shield country. Over the years they have published a number of articles and books on their archeological work. The voices of the Ojibwa elders illuminate these rock sites. By recalling oral history and legends, their knowledge helps us to understand the meanings behind the ancient carvings and paintings. (You can get a copy directly from Thor Conway or from Amazon). See here for a list of the chapter headings and the specific sites he examines. To make sites a bit easier to find, I have divided the province into the five following regions, with Highway 17 the northern limit of 1 and 2. Quetico got the #1 spot given its early importance in Dewdney’s two-decade-long quest! Please note – While I have visited a few of the sites mentioned in this post, for the most part I am drawing from fairly meagre sources (online and at the Toronto Reference Library), as well as the occasional email contact. Some site locations that you will find here are vague and, I am sure, completely wrong! It may be the nature of the source I used; it may be my bad interpretation of that source. Over time I hope to eliminate most of the inaccurate information. 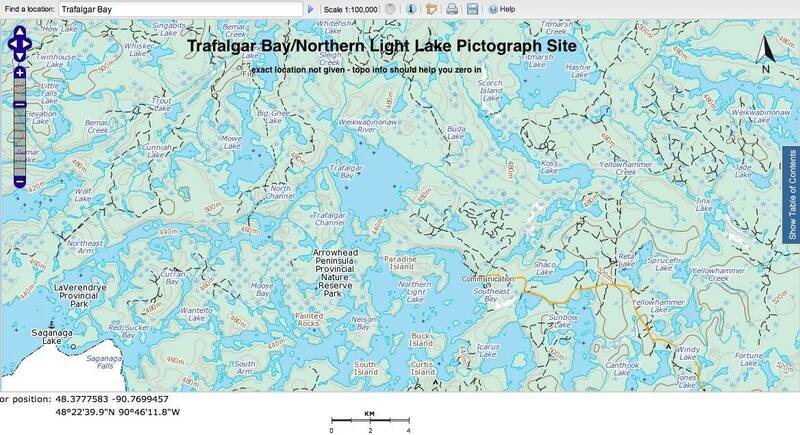 Quetico Master Map with forty sites indicated – kml file in my Dropbox folder here. It can be opened by the free Google Earth application installed on your computer. 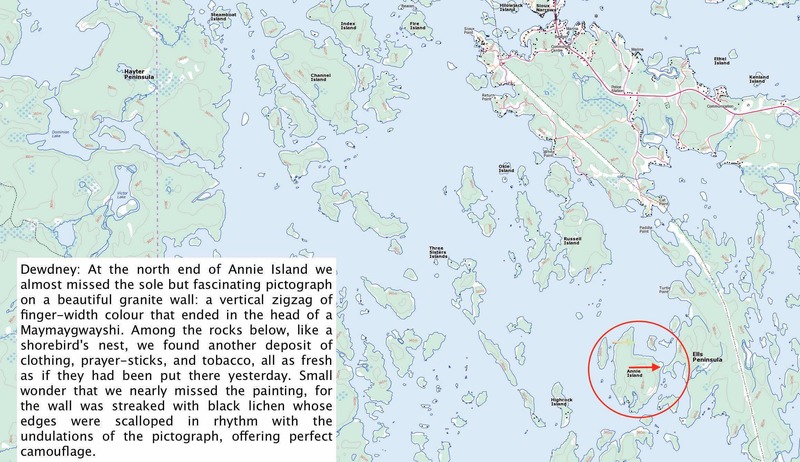 The best single book on the Quetico pictographs – location, meaning, cultural context – is Michael Furtman’s Magic On The Rocks. (Click on title for more info.) When I get to Quetico, the book will definitely be coming along. I’ve used the Furtman book for most of the locations in this section. 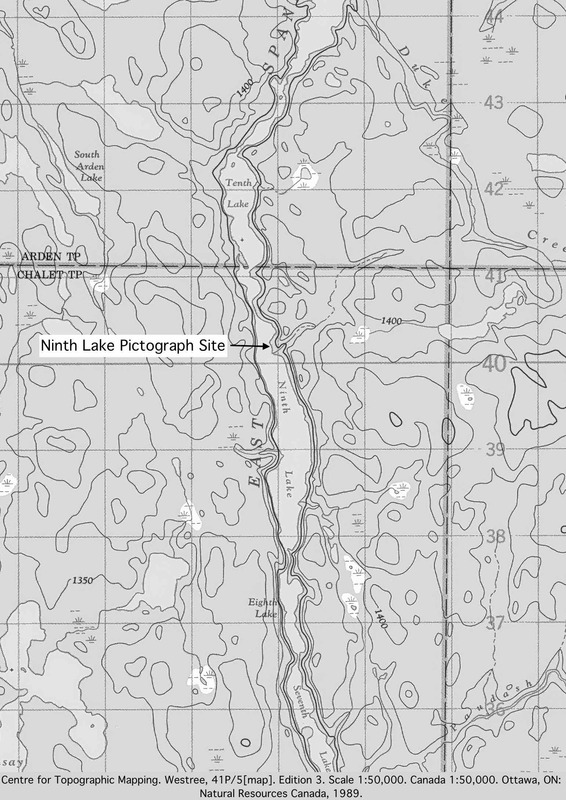 The Northwoods Memories website has “bulletins” of many of the Quetico and nearby BWCA pictograph sites. Included on each sheet is the location and a brief write-up of the various images at the particular site. 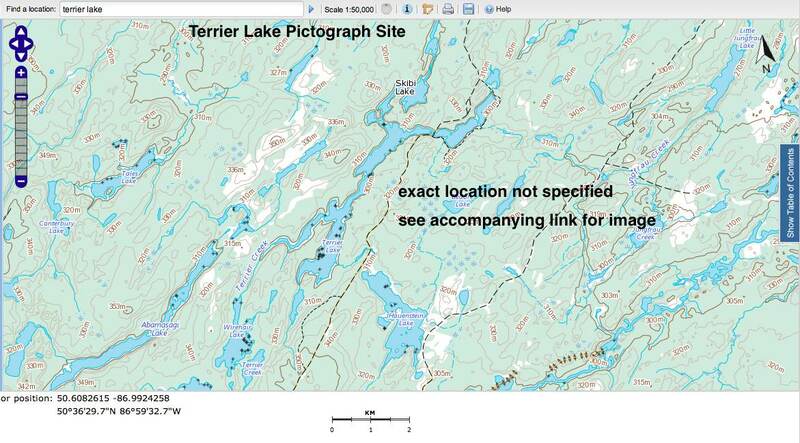 Agnes Lake – see here for detailed maps & discussion of 7 different sites. 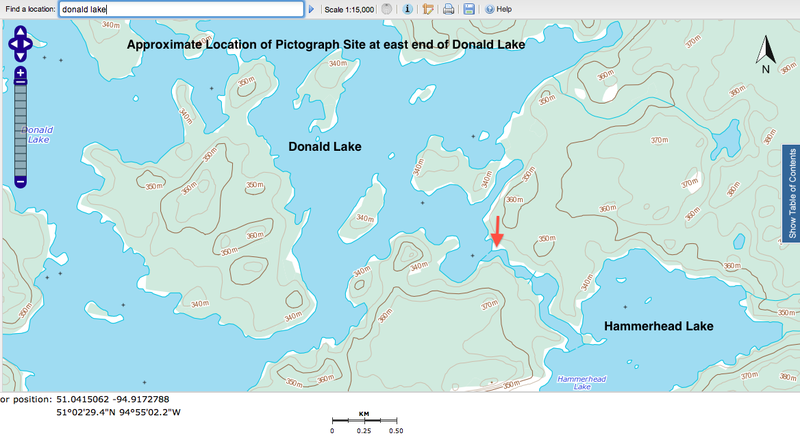 Dewdney recorded his first two sites on this lake in 1957 to begin his pictograph quest. 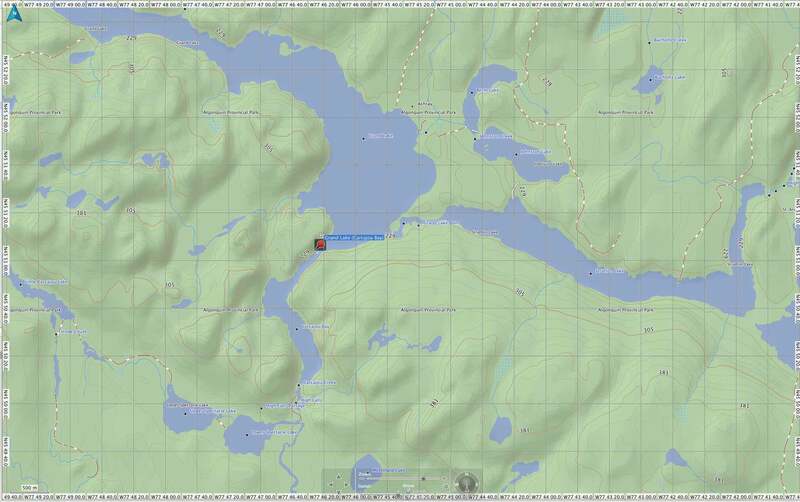 Darkwater Lake (formerly Darky Lake) in Quetico – map here. Conway’s Discovering Rock Art (2016) includes a chapter on this site. Pictured Lake – also see the front cover of Dewdney’s book! Burditt Lake (aka Clearwater) – see here … Rajnovich pp. 92-97 for discussion – location unknown. See here for brief Dewdney discussion of site and examples of images. 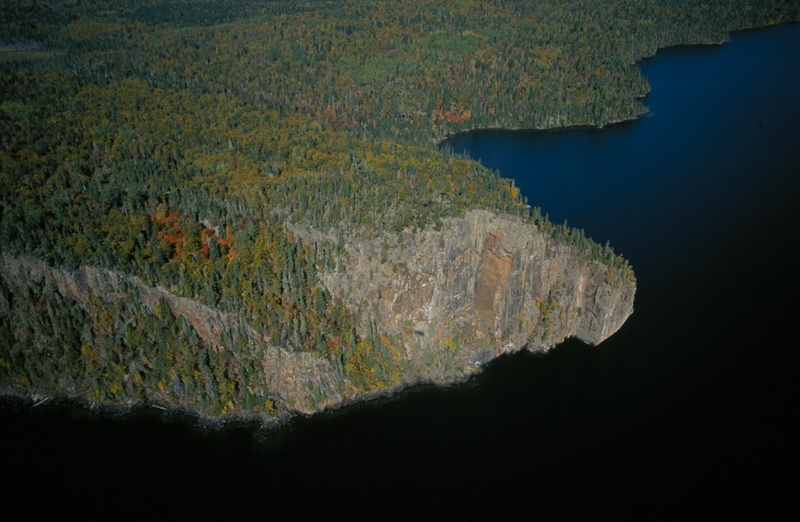 Cliff Island (Lake of the Woods) – north side of Sunset Channel/about 30 kilometers from Sioux Narrows. 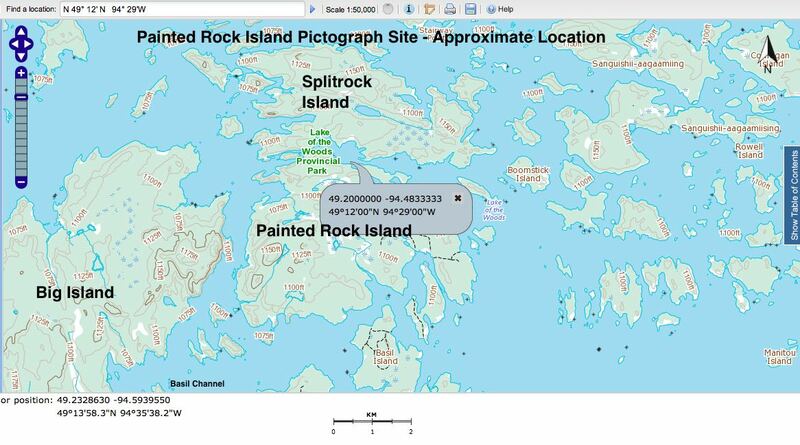 Exact location not yet determined – western end on the south side of the island seems most likely. 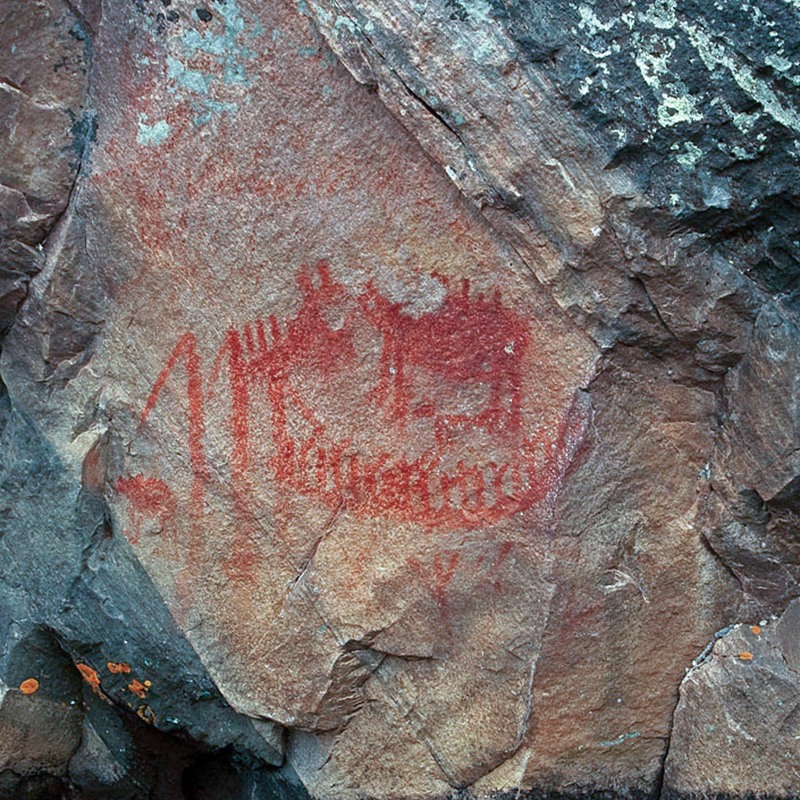 A rabbit man, an animal figure, and other images and markings. 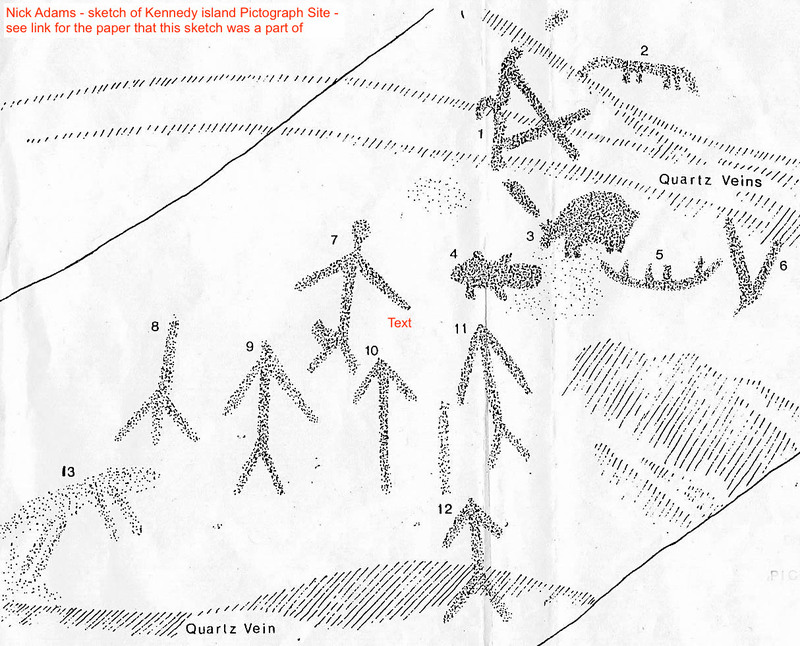 Dewdney also mentions a petroglyph site 1/2 mile to the east of the rock painting site. 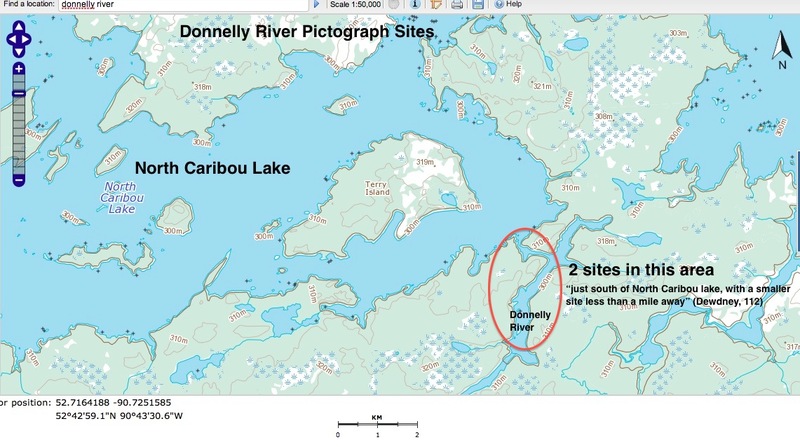 Cuttle Lake: two sites – larger one and a small one about 300 m south Ontario Archaeology Arch Notes article (pages 6 to 9 ) accessible here has a detailed discussion by Rajnovich. 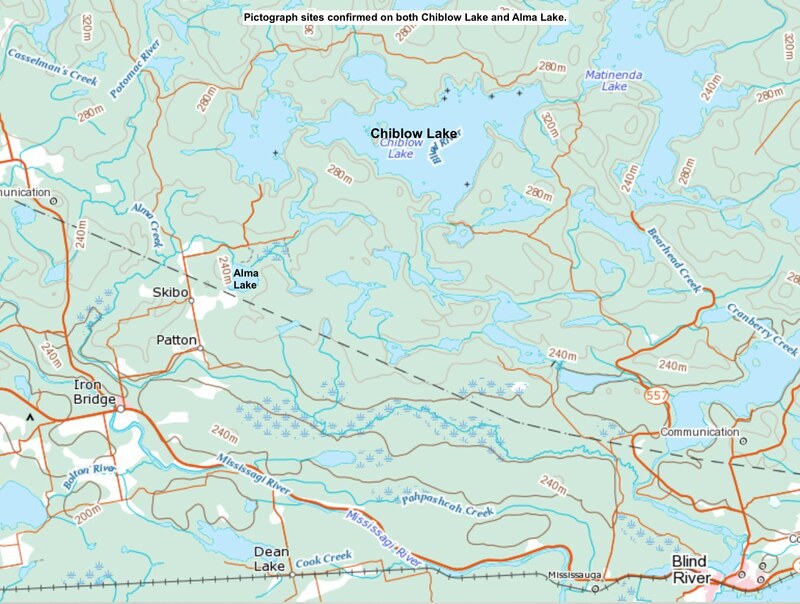 Devil’s Gap Lake in Turtle Lake Provincial Park – and a part of the Turtle River canoe route – has a “great set of pictographs” according to Backroads Bill (Bill Steer). 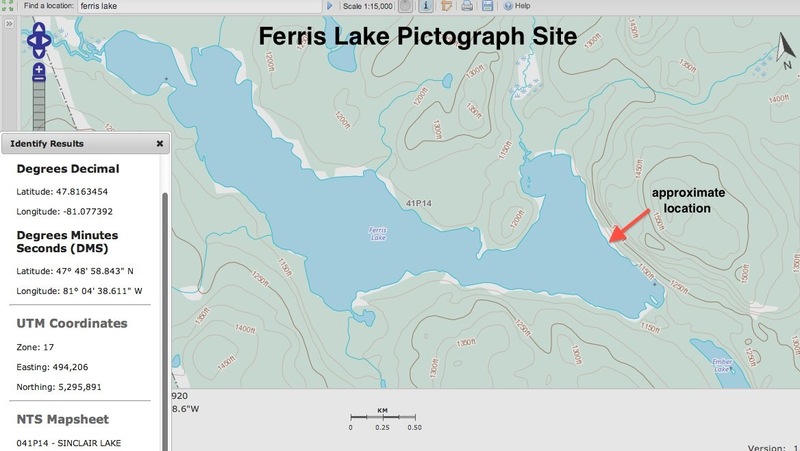 While the lake name does not appear in Federal Government topos or on the Ontario Gov’t topo site, it may be a name used by locals. Nearby is what Steer calls a dolmen stone. See his article here. 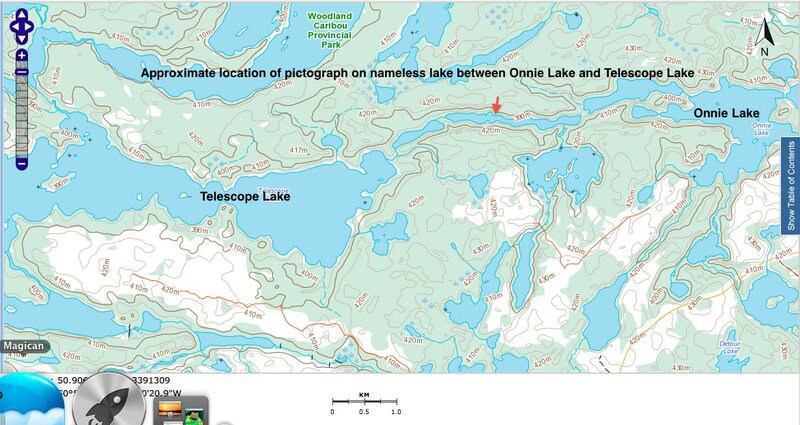 Ignace-area: unnamed lake – the Smyk site and another. See here for Ontario Archaeological Society’ Arch Notes Sept/Oct 2014 pp 10-11 for Dennis Smyk’s brief report and included photo. 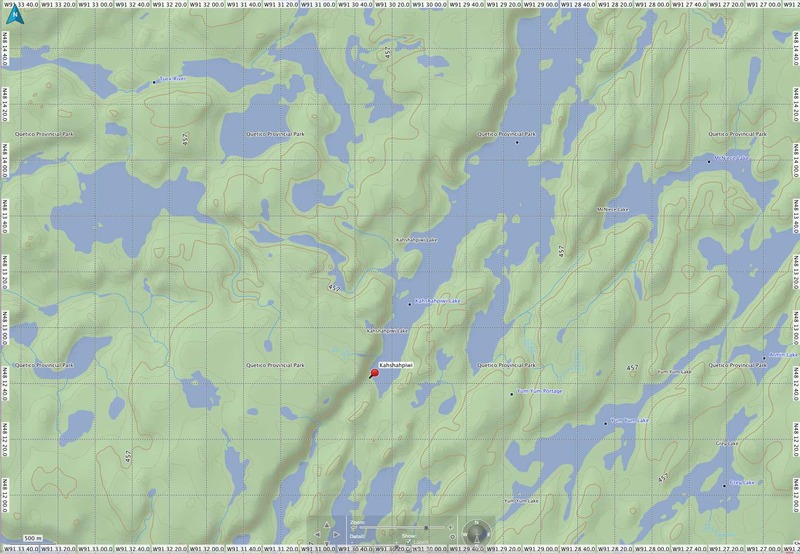 Google map of Ignace area and its 1000 lakes here! Not too helpful! 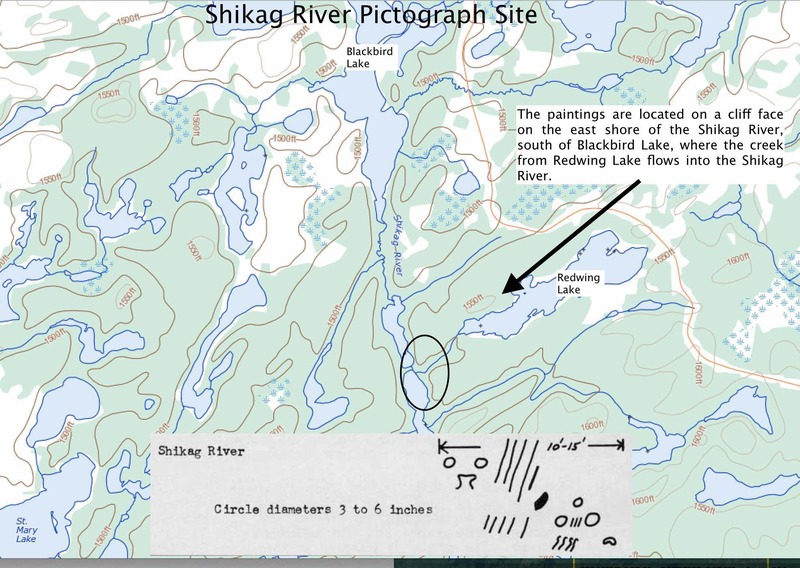 Smyk has apparently located some 150 pictograph sites in the Ignace area over the years. 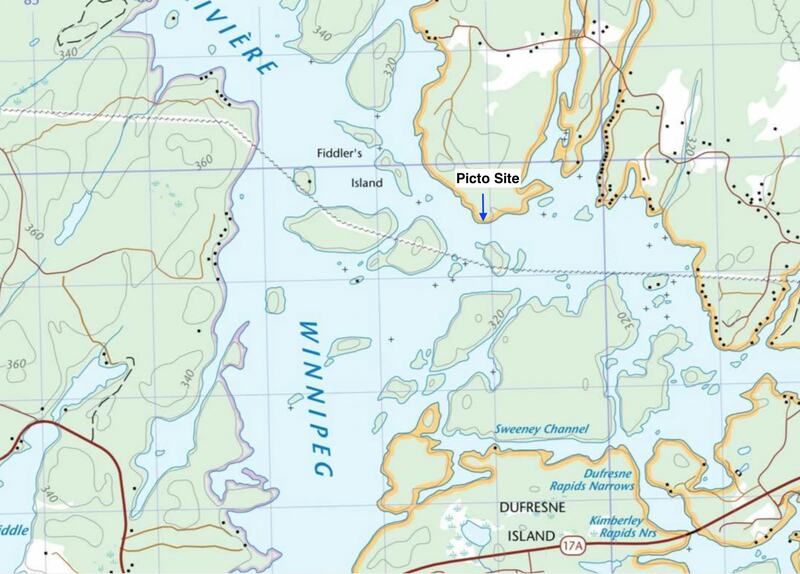 Jackfish Lake – 1:50000 topo map of the lake here; picto on one of the lake’s islands. See here for a 2.5 Mb pdf file with images. For Dewdney text see here. 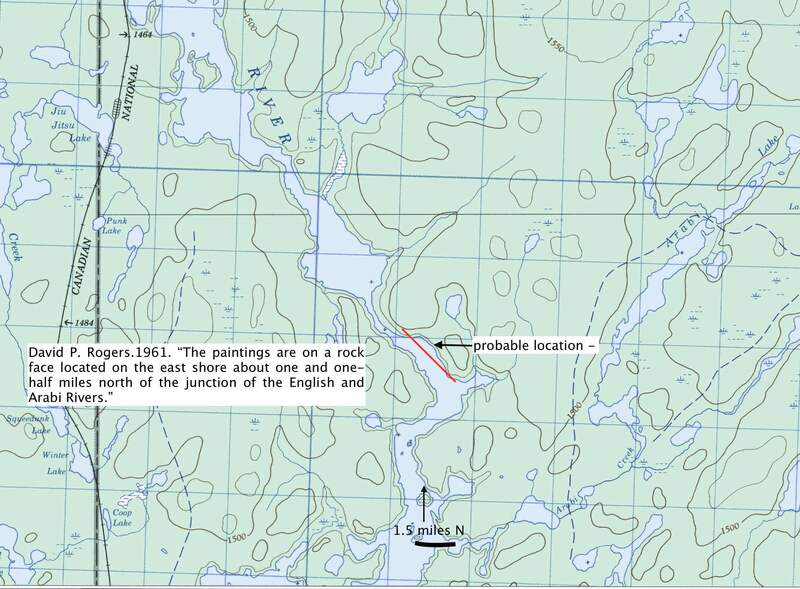 Picture Rock Point/Western Peninsula (Lake of the Woods) – Dewdney mentions a humble rock painting site found on one of the 100+ points of the Western Peninsula! The name he gives is Picture Rock Point, one that does not appear on the topos. The pictographs, he writes, are “painted on a thick, rough encrustation of lime, and, with the exception of the human figure, are obscure.” Location – undetermined! 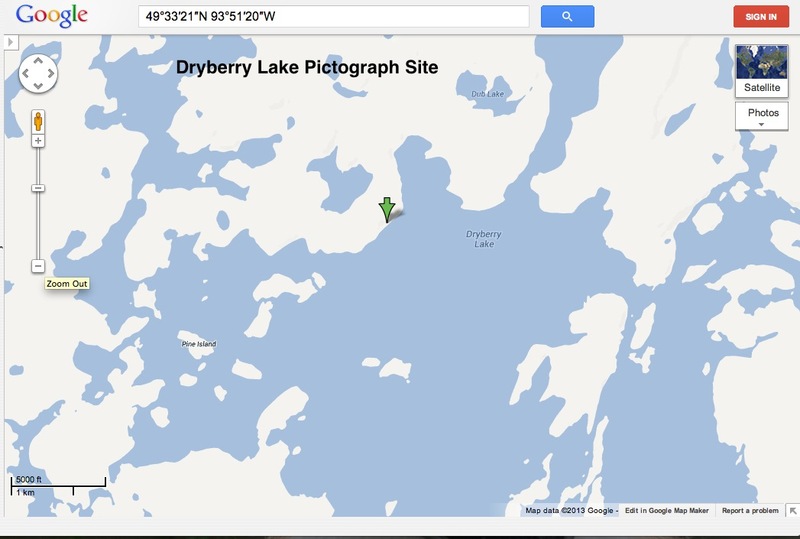 Portage Bay (Lake of the Woods) – site briefly mentioned by Dewdney -“the equally modest site at Portage Bay, a few miles west of Western Peninsula]”. There is another Portage Bay at the north end of the Lake at Keewatin. 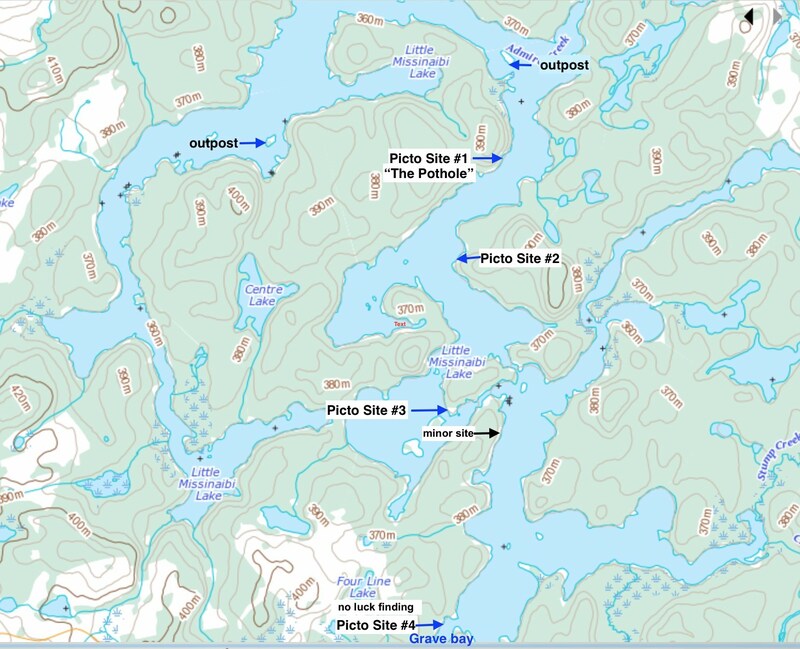 Pukamo Island (Rainy Lake) Rajnovich paper p. 26-31 with drawings; map here; also a photo. Article no longer accessible- but see here for a cached copy. 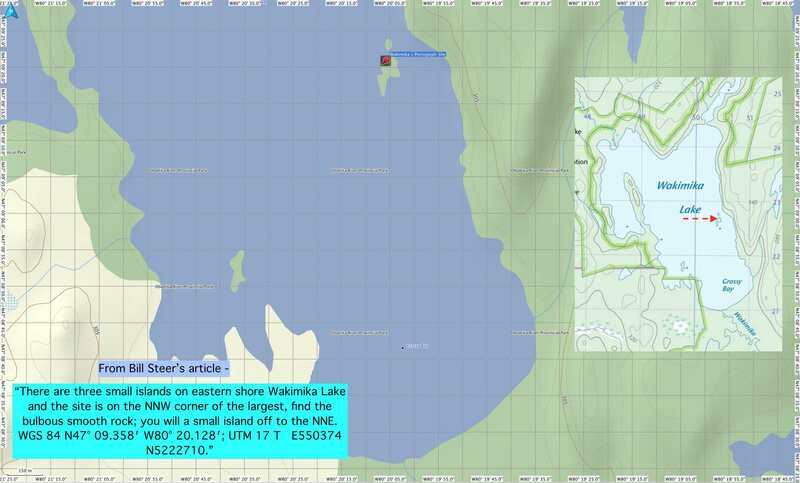 Whitefish Bay – There are at least a half-dozen sites recorded in this area. 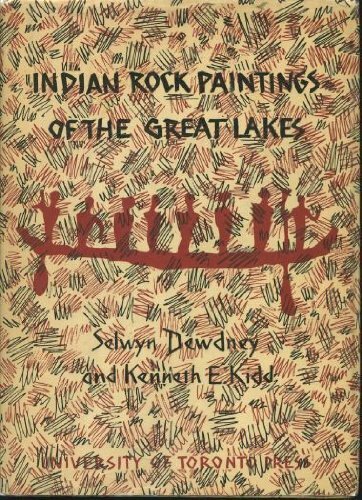 Dewdney’s Indian Rock Paintings of the Great Lakes (pp. 40-53) provides some detail on them and on the ones just to the west and north of the Aulneau Peninsula. See here for the Dewdney text. 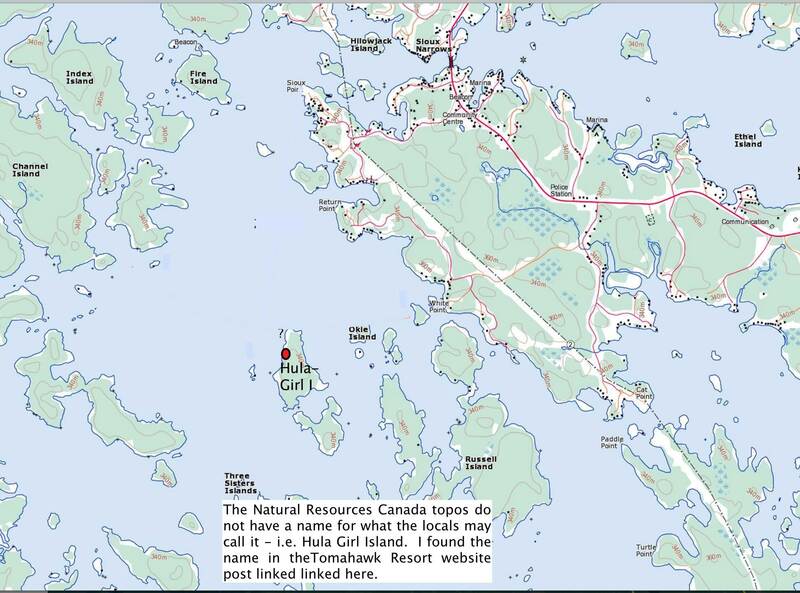 Whitefish Bay “Hula-Girl” Island Site – Identified as the “Sioux Narrows” site by Dewdney, it faces west at the northern end of an unnamed island locally called Hula-Girl about two miles south of Sioux Point. 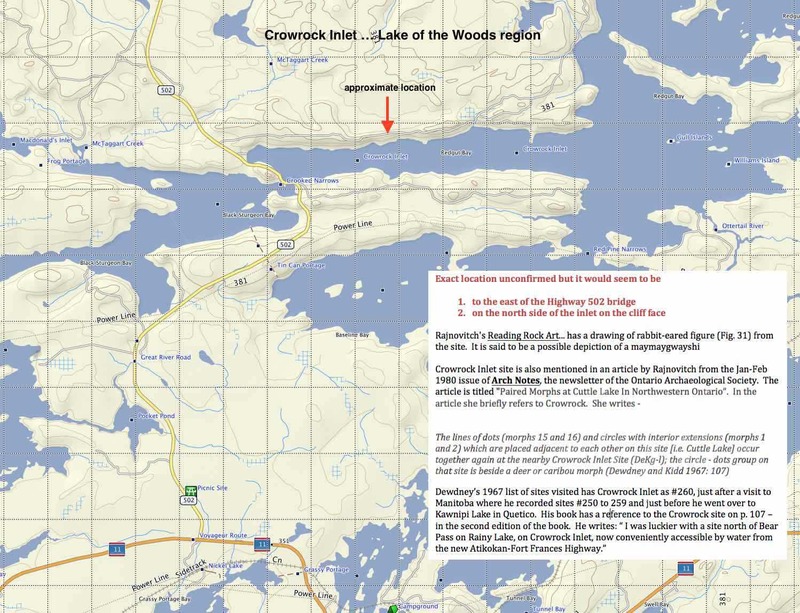 See here for Dewdney’s discussion of the site he listed as #28. Also, see this Tomahawk Resort post for a couple of pix of the site in wintertime. A reader sent in the exact GPS coordinates – see the Google map here. Winnipeg River (near Eagle Bay Road in Kenora) – location here. 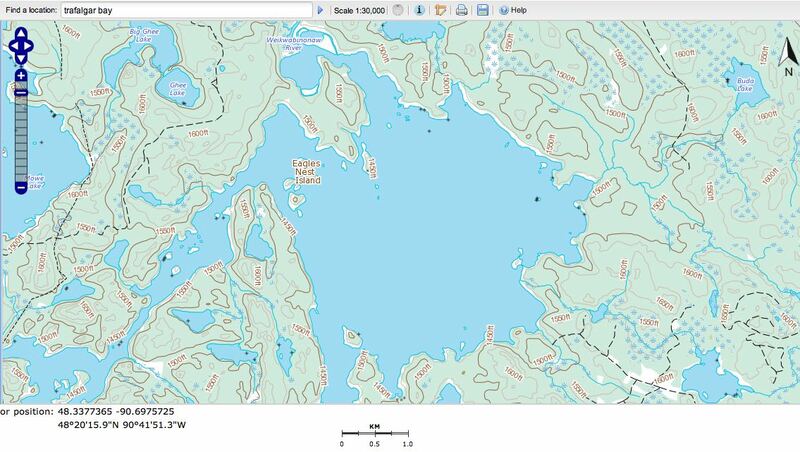 White Otter Lake -See here for the Natural Resources Canada 1:50000 topo 052G04 White Otter Lake. 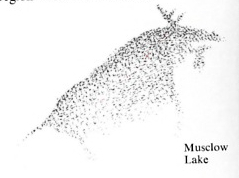 The Toronto Public Library system’s Central Reference Library has one copy of Jaqueline Rusak’s brief study titled “The White Otter Lake Pictograph Project:1991 Results”. 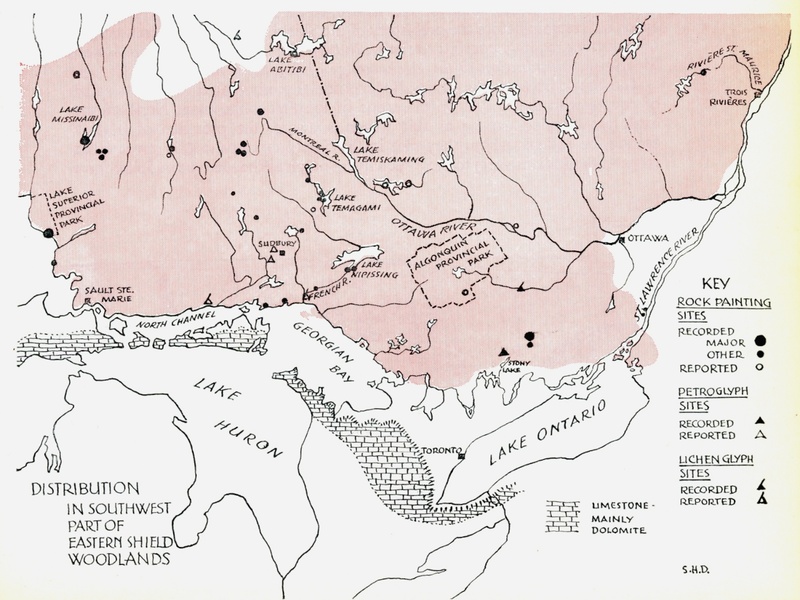 A positive review of Rusak’s work in Ontario Archaeology Notes (1993-1) by Andrew Hinchelwood is accessible online here. An email from someone who attempted to locate the various sites using the study was much less enthusiastic. Locations, distances, and site descriptions were apparently often unreliable. 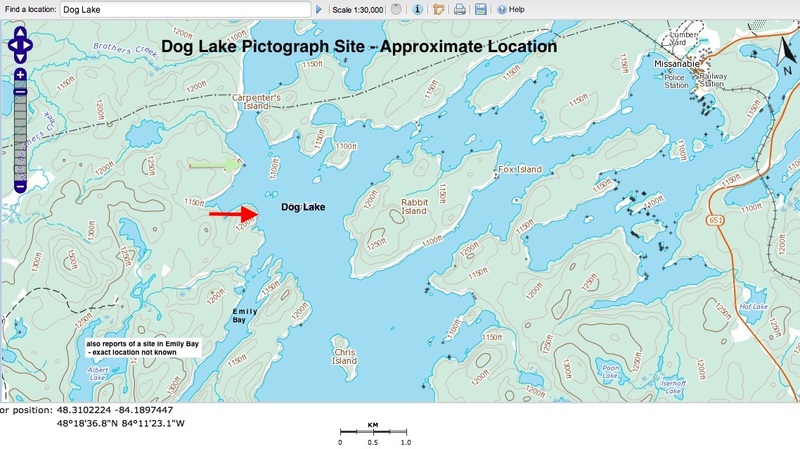 I had never heard of White Otter as a pictograph site before finding her study; I used it to locate the 24 White Otter Lake sites she mentions on the above Garmin Topo Canada map. The email correspondence mentioned above prompted me to reduce the sites to two on Anne Bay, supposedly two of the best, and a number of sites on the west side of Big Island. 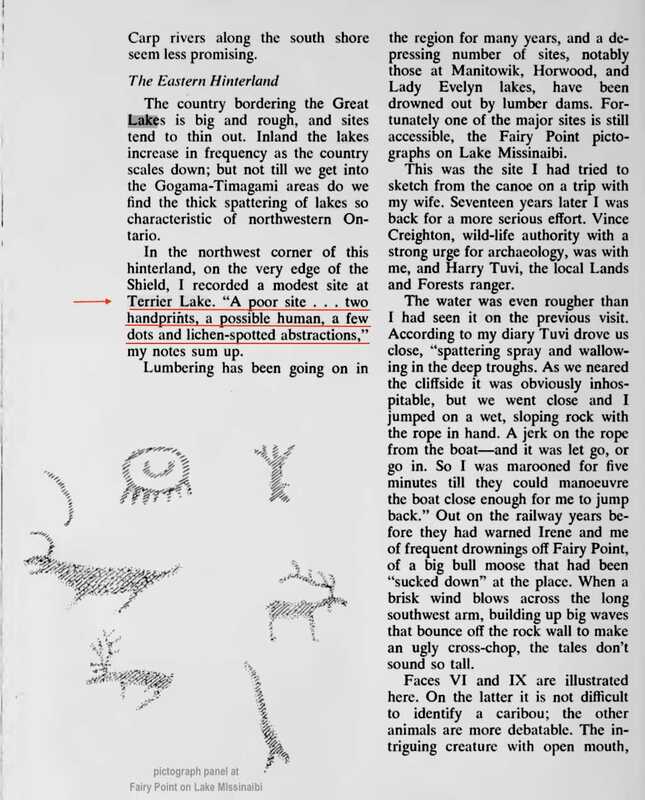 Also noted was his opinion that the Turtle River Park pictograph sites not on the lake were more impressive. Cliff Lake (Pikitigushi River) – see here for my post on a few dozen pix of the pictographs; do not confuse this Cliff lake for the Cliff Lake in Kenora District, something that Dewdney did for a decade before realizing his mistake. Click here (pp. 135-141) for Dewdney’s discussion & drawings; see also here . 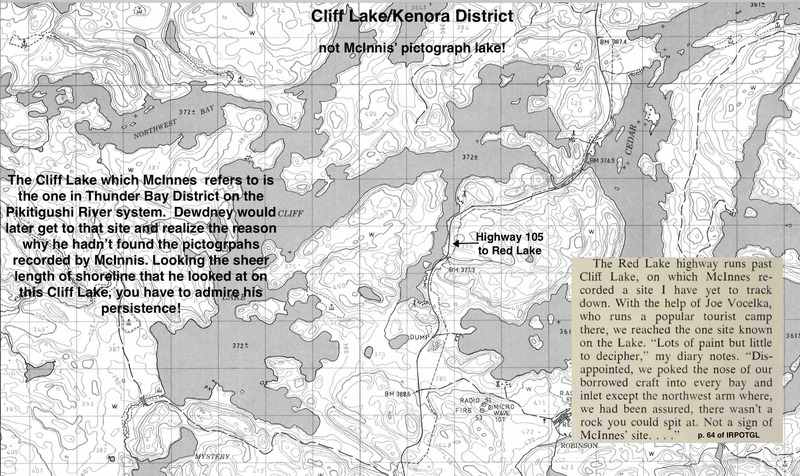 Also, check out my two posts on the Cliff Lake Pictographs elsewhere in this blog. Harmon Lake (Wabakimi) Brightsand River system. 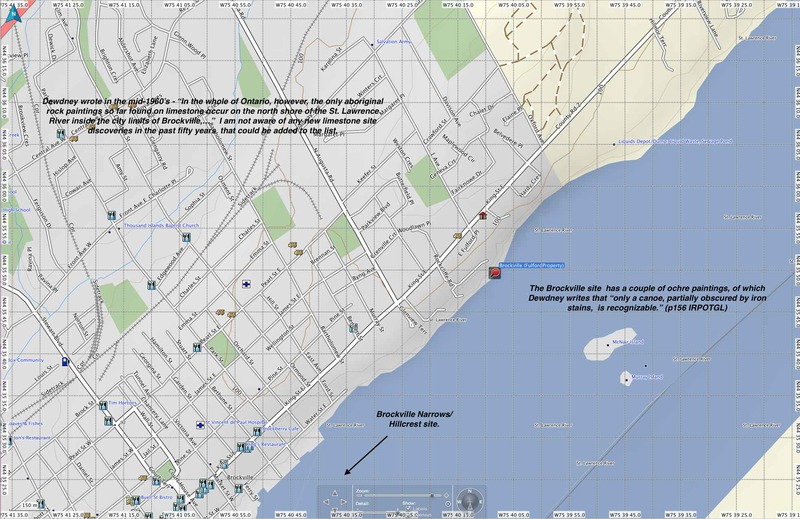 See here for source & location info of the above site on the north side of the bay. 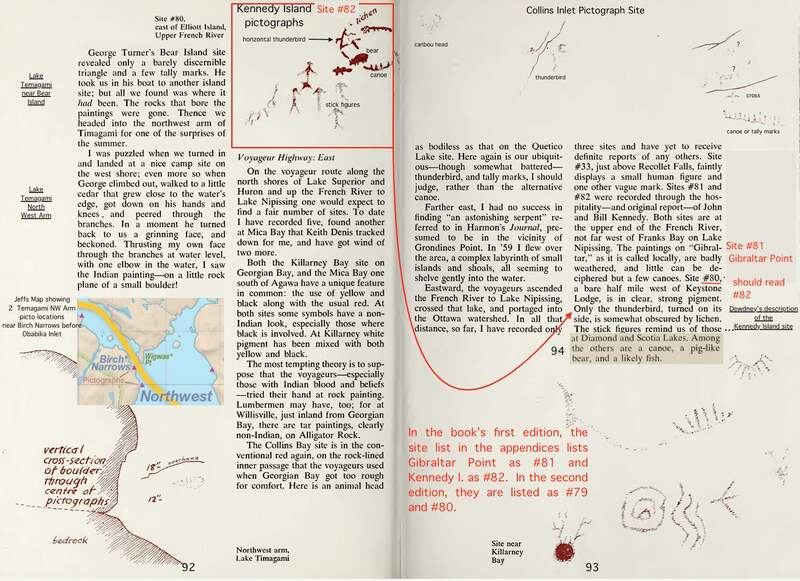 Dewdney would later visit the site and include it (site #151) in the second edition (1967) of his book. No info yet on the site indicated on the opposite shore. 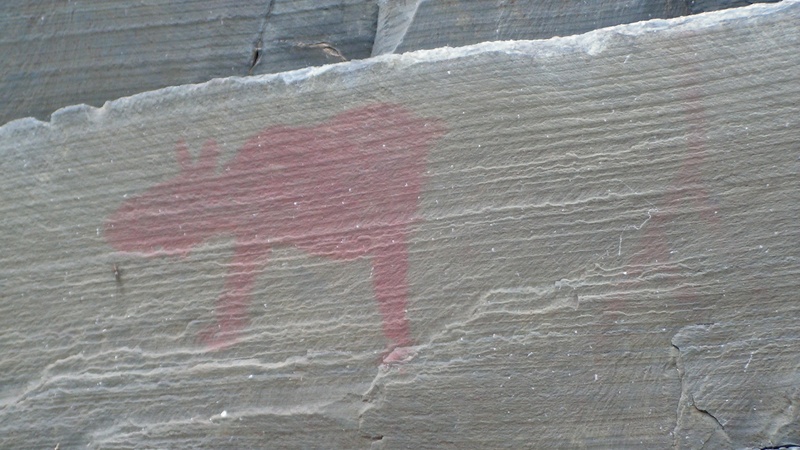 graffiti at Echo Rock on Lake Nipigon – but no sign of the pictograph! 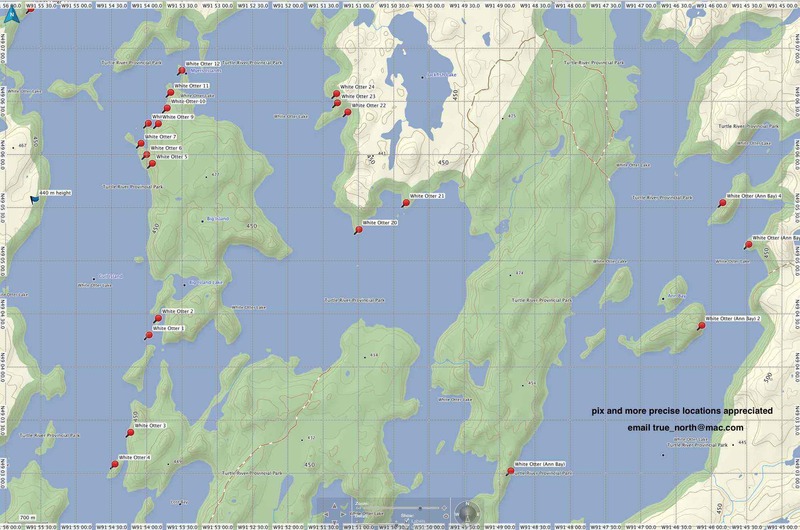 Lake Nipigon (Orient Bay) – see here for the pdf file with map and quotes from Dewdney and Morrisseau about the site. Misehkow River – one site mentioned but location unknown. We looked but didn’t find! Murdock Lake – a part of the Bloodvein River system. Two sites located – one at the east end of the lake, the other about 1.5 km. west from the north end of the lake on the way to Larus Lake. See here for the minor site and here for the very large one. A fellow blogger also has a couple of pix here. 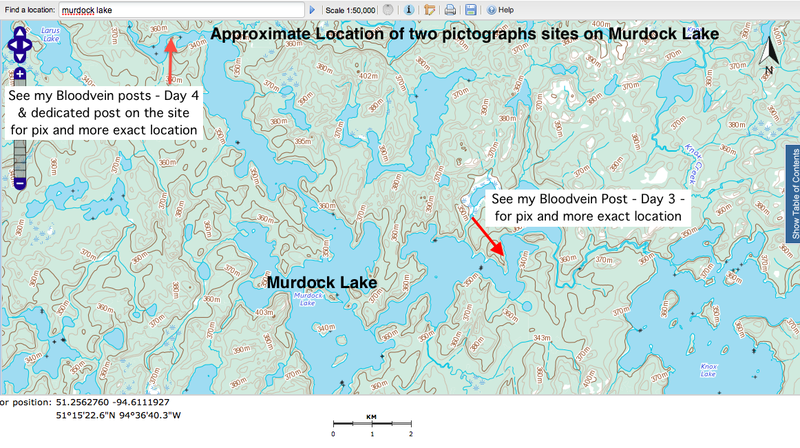 Musclow Lake (off Bloodvein River system via Barclay Bay). 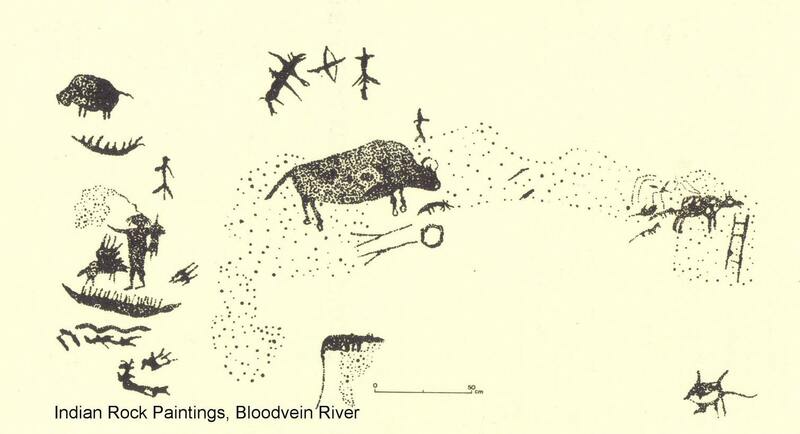 See here for Dewdney sketch of the one pictograph at the site. Maymaygweshiwuk – mythical creatures (small and hairy) associated with rock painting sites and credited for the actual paintings by some Anishinaabe elders. They were believed to live within the rock face itself and shamans would petition them for requests of medicine, special knowledge, or other favours. See here for more information. Palisade River (Wabakimi) – where the Slim River joins. There is indeed a nice rock face there but we paddled right by three times in 2012 not even knowing that there was something to be seen! It was one of my motivations for starting this series of pictograph posts the next year! If you pass by, send me a jpg of the rock image we missed! I’ll post it right here (if you don’t mind!). A YouTube poster, John Wanserski, has a very well done nine-minute video of the Agawa Rock pictographs, complete with the visuals of the trail to get there from the highway and great shots of the pictographs and of the lake. 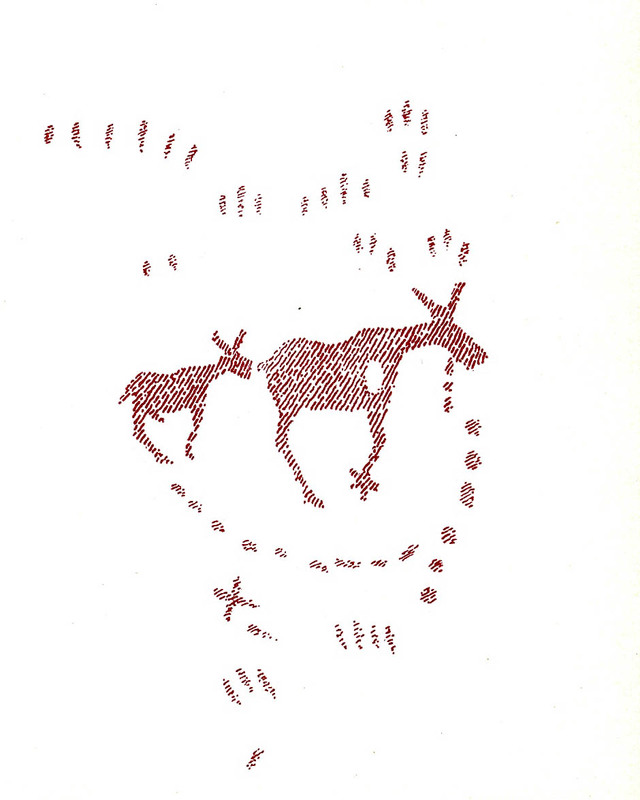 He introduces images of the actual pictographs by showing drawings of the same images first. It certainly makes clear the fragile and fading glory of the rock paintings. You can see the YouTube video here. 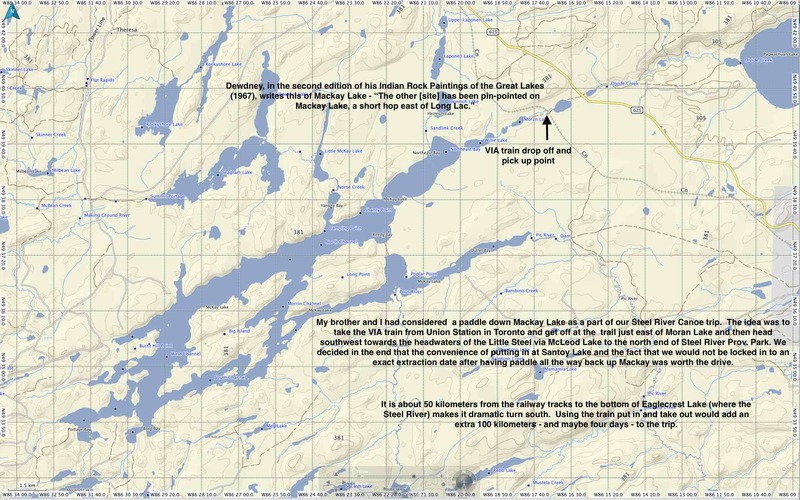 Alma Lake – Algoma District – see map here. 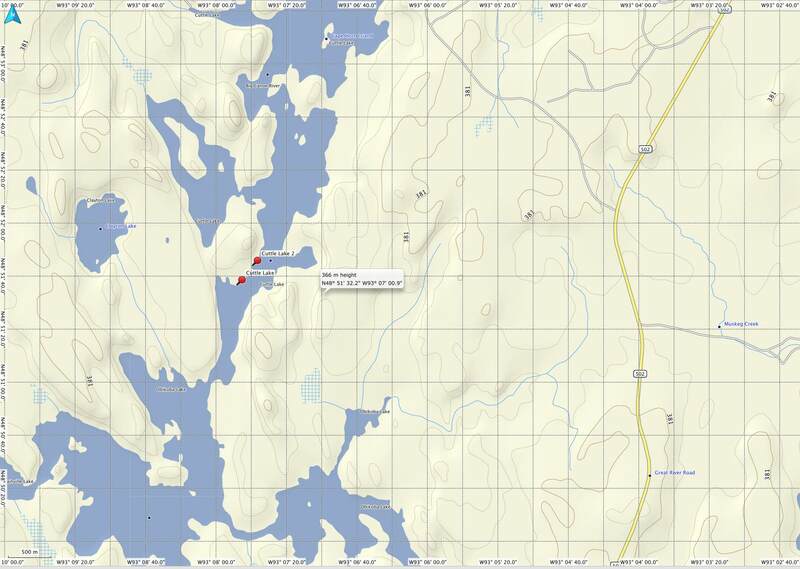 Exact location not determined but most likely at the west end of the lake. One pictograph is of a crane footprint, a symbol for one of the five major doodems (totems) or kinship groupings in Ojibwe society. 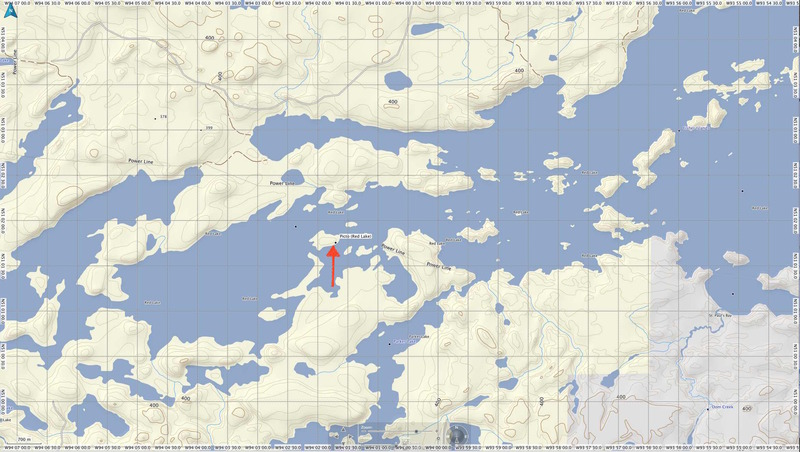 Chiblow Lake – Algoma District – see here for a map of the lake and surroundings. 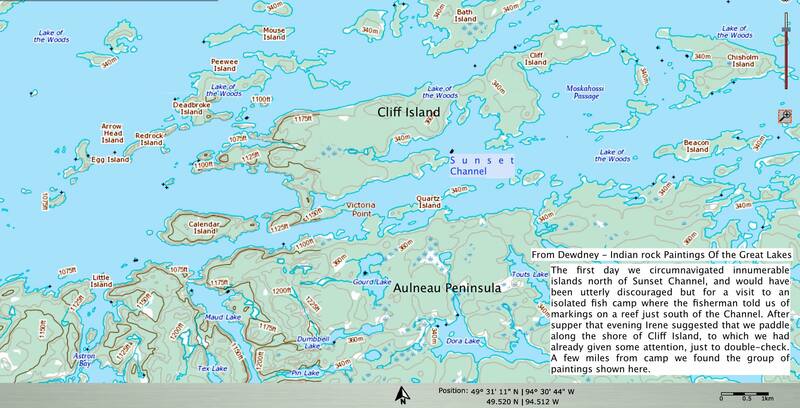 Exact location(s) to be determined – lots of shoreline vertical rock to check out! Collins Inlet (Phillip Edward Island) – two Thunderbirds, a war canoe, and a couple more. In June 2016 we visited the site. 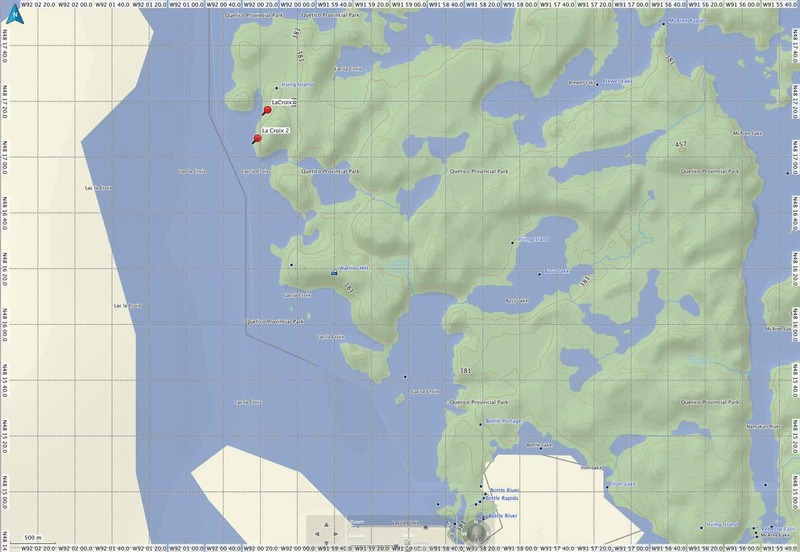 See my post Paddling Around Philip Edward Island – Part Two for more pix, another map, and discussion. 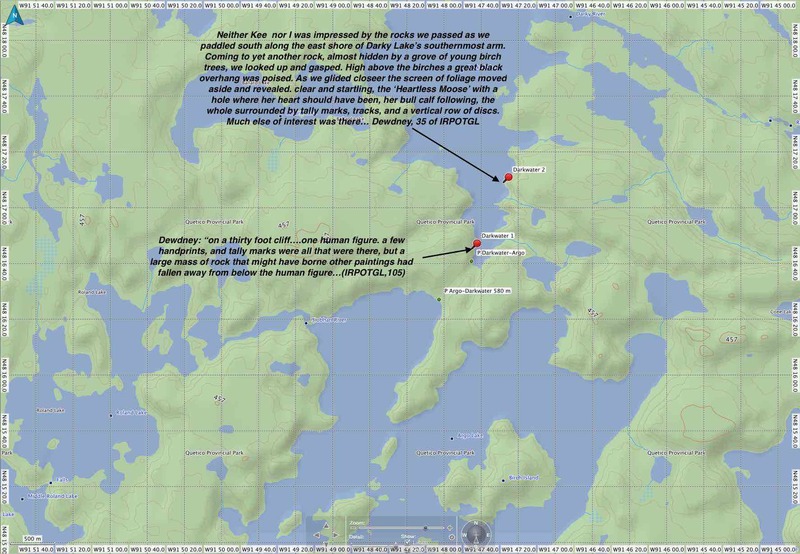 Diamond Lake map here In October of 2014 my brother and I revisited the site. 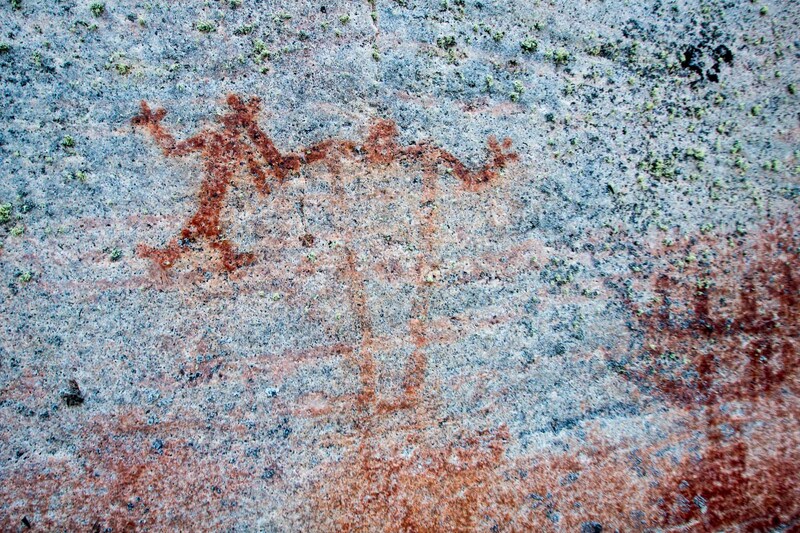 Revisiting Temagami’s Diamond Lake Pictograph Site has lots of pix and discussion. 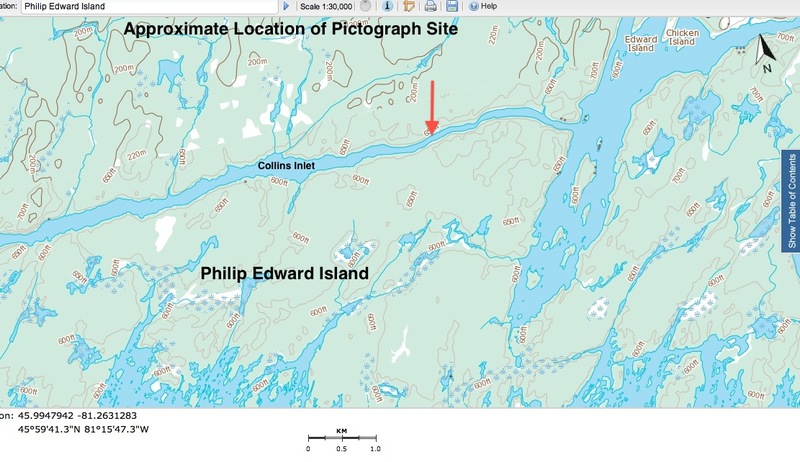 French River – Gibraltar Point. In a mid-80’s paper, Nick Adams noted that the site had been defaced by graffiti. Once visible were four canoe images, a stick figure and other undecipherable and weathered morphs. 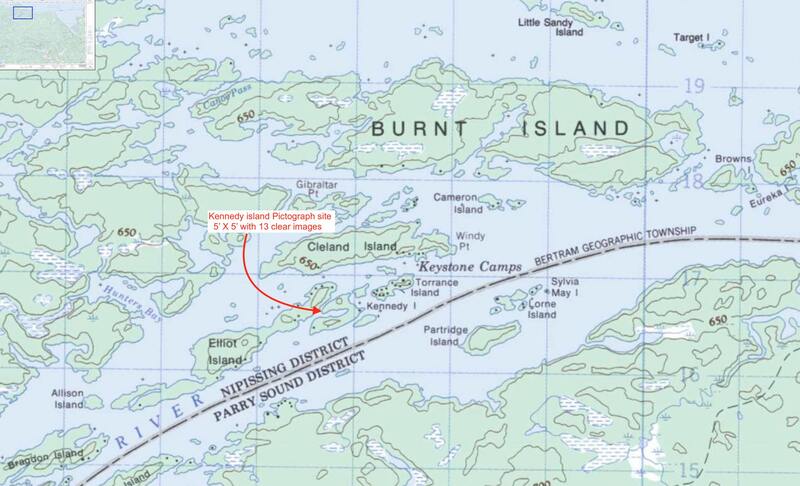 French River (Kennedy Island) – see here for early 1980’s paper by Nick Adams and site drawing source. 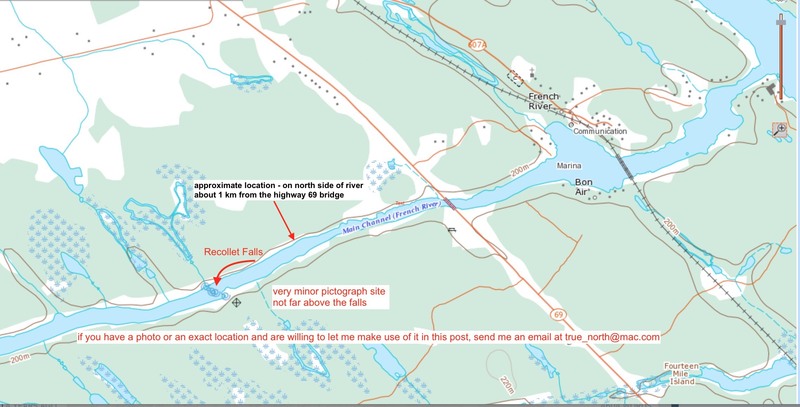 Dewdney has a brief paragraph on the French River sites here . He visited the Recollet Falls site in 1958 and the two upper French sites the following year. 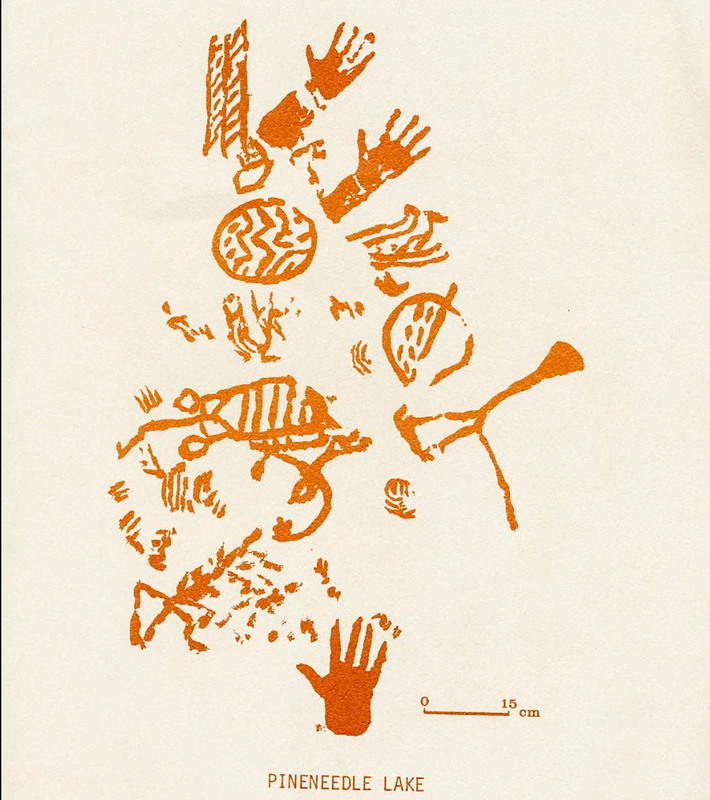 Thor Conway’s Discovering Rock Art has a chapter on the Kennedy island pictographs (pp. 103-126) with lots of detail. See also here for my annotated version of Dewdney, pp. 92-94. 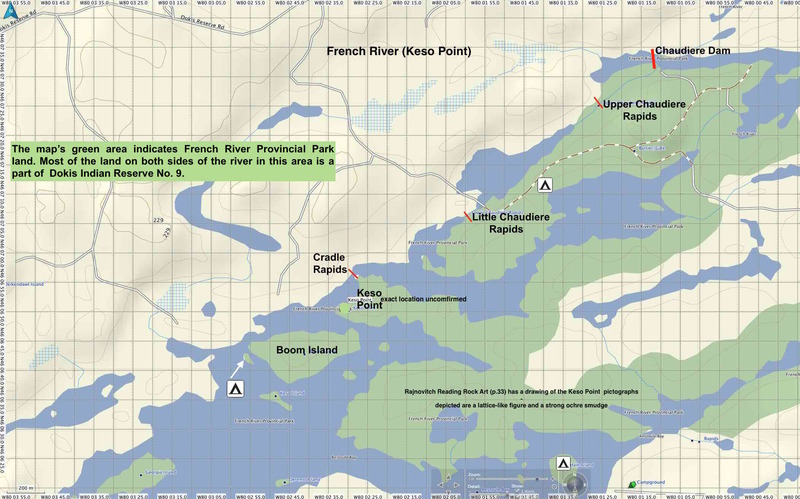 French River (Keso Point) – see this pdf file for more info and sources on the site. French River – just above the Highway 69 bridge on the north side of the river – a human figure, perhaps an animal image, and a couple of lines. Exact location not confirmed yet! “Just above” makes it sound closer to the road than the cove and marina. French River – Recollet Falls – just above the falls on the north side about 1 km from the highway bridge. Dewdney notes the faint painting of “a small human figure and one other vague mark”. 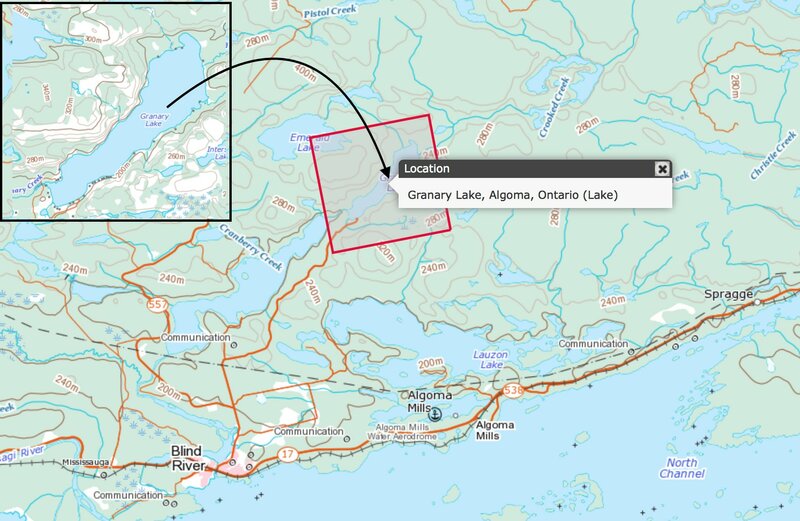 Granary Lake – Algoma District – see here for general location. 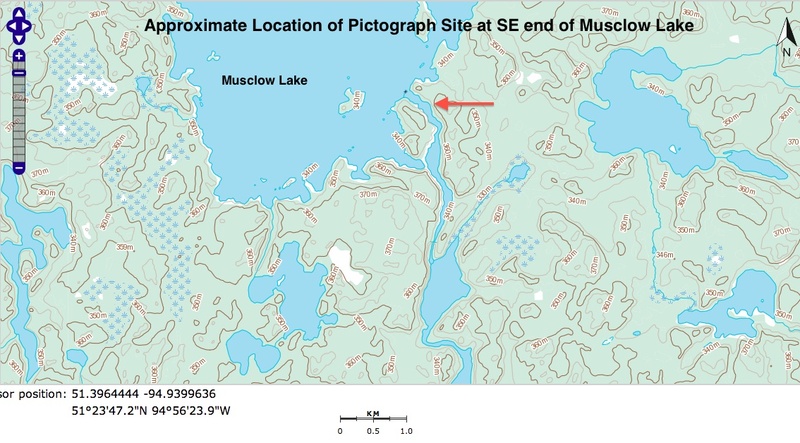 Location of the site not yet determined but the west shore of the lake is the most likely. 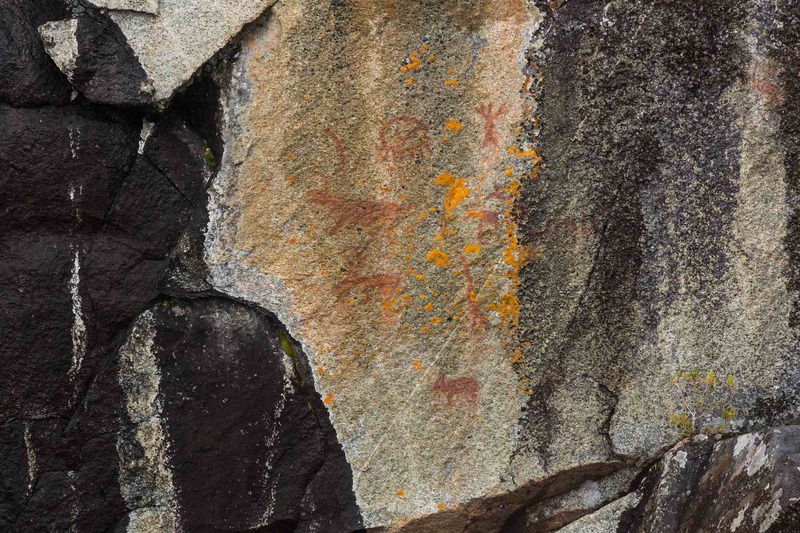 Killarney Bay – see here for the story of the pictographs’ recent origins. I include quotes from Dewdney (1962) and an Ontario Government Geological Survey (early 1980’s). 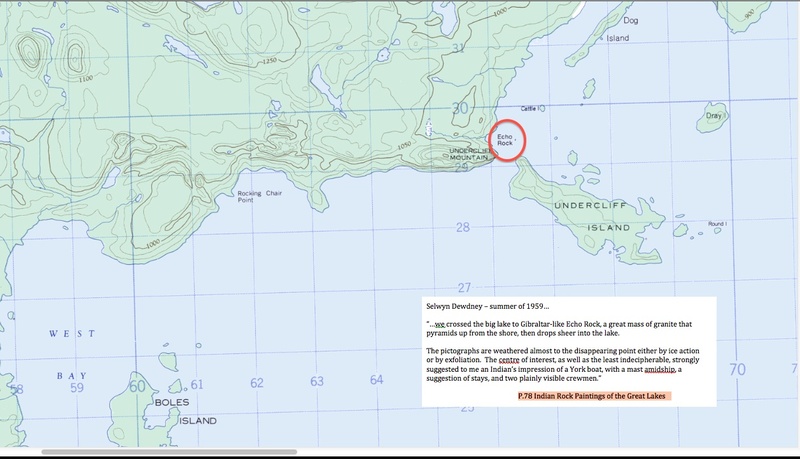 See the image to the right for a pictograph panel which Dewdney says is a “site near Killarney Bay”. It is not clear if this is the one he and the Ontario Government Survey are referring to. 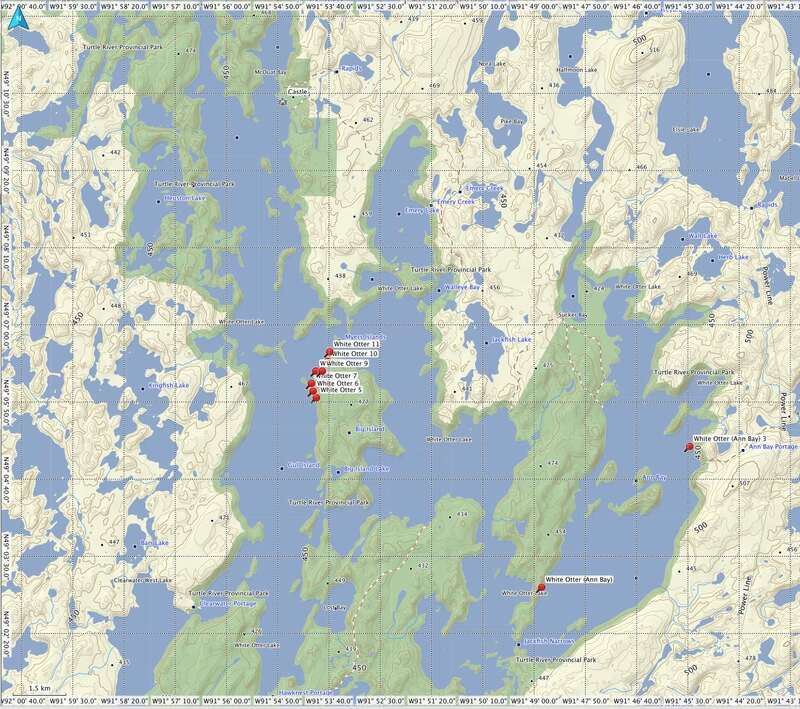 Lake Temagami – numerous sites indicated on the Friends of Temagami map. 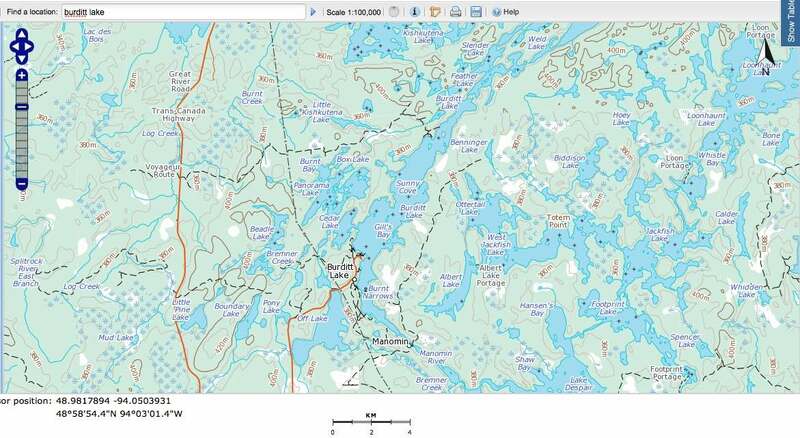 Jeff’s Temagami maps also indicate the various sites. 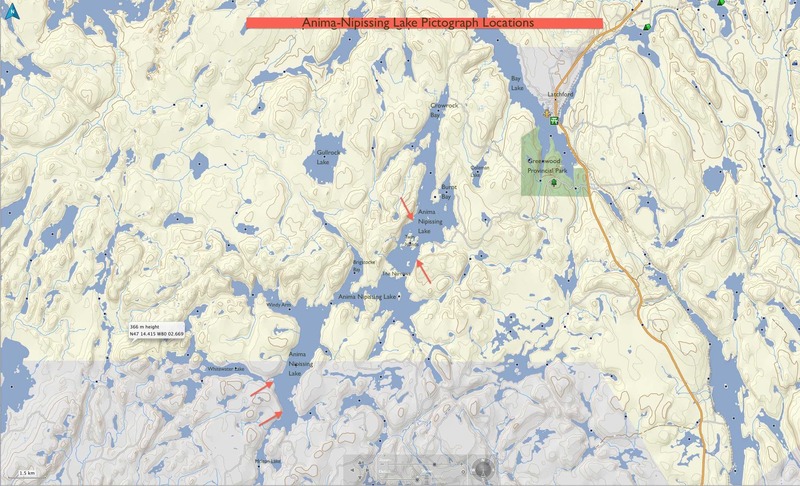 Lake Temagami (North West Arm) – See here for a brief Dewdney description along with the relevant bit of Jeff’s Temagami map. 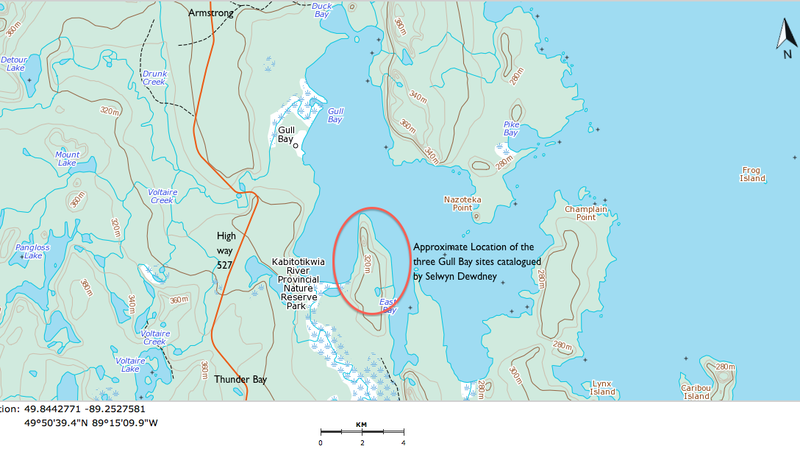 There are two sites just before the narrows to Obabika Inlet. We camped there one rainy night in October and could not find anything. Send me a jpg if you do! 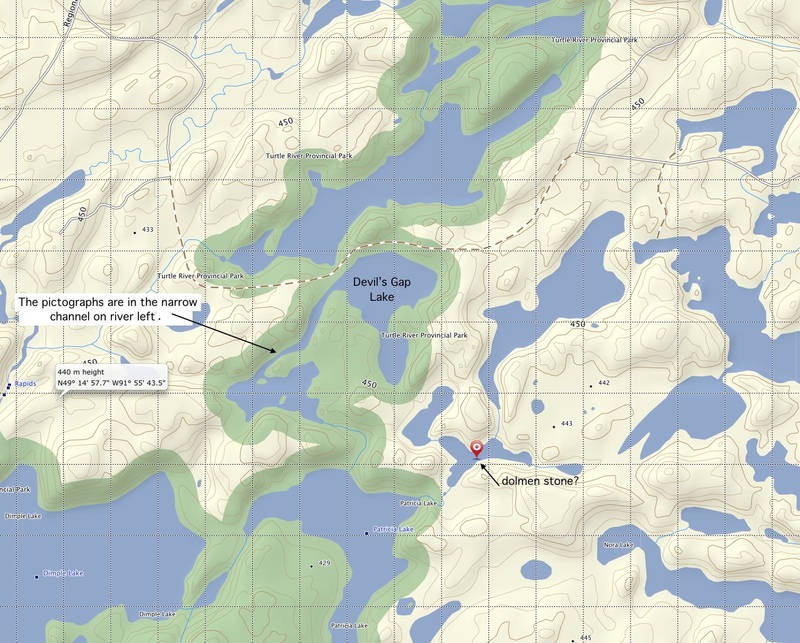 Little Missinaibi Lake – map with four sites here. 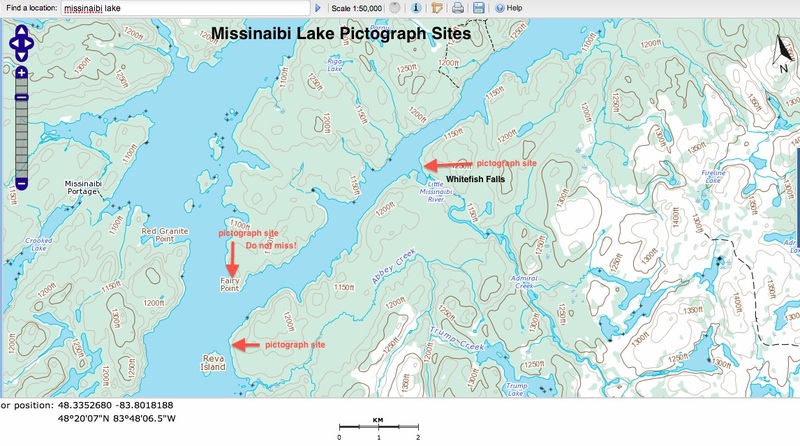 The Chrismar map Missinaibi 1 indicates the location of the sites as does Hap Wilson’s canoe tripper’s guide to the Missinaibi River. 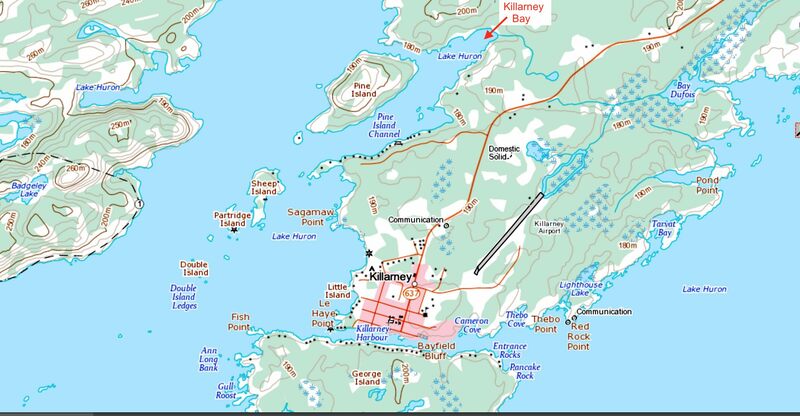 See my post The Pictographs of Little Missinaibi Lake for an in-depth look with maps and references to Selwyn Dewdney’s late 1950’s and Thor Conway’s mid-1980’s work on the sites. A June 2017 visit by my brother and me resulted in lots of photos. 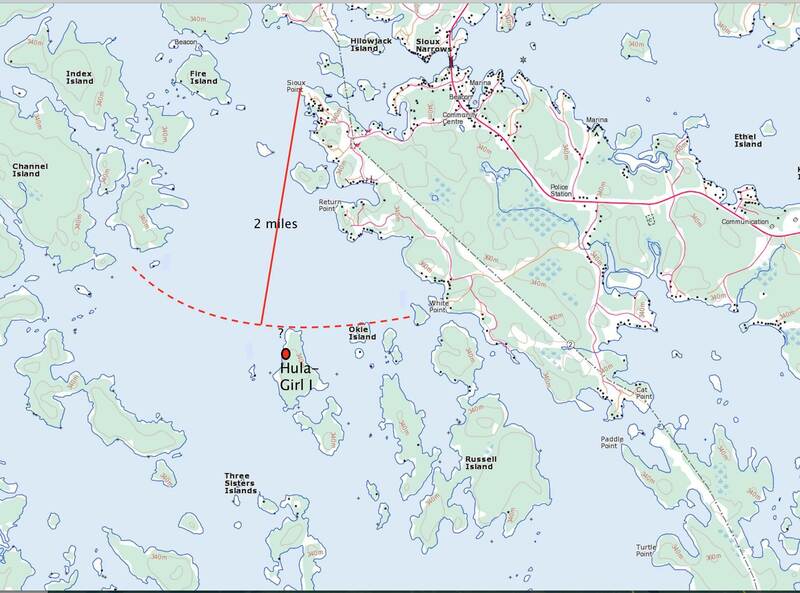 While the Grave Bay site remains unconfirmed, thanks to directions provided by a reader of this post we did see another minor site on the way to Eagle Island from Grave Bay. The above post has all the details. Matabitchuan River Thor Conway paper with illustrations pages 35-37 – if article not accessible – See here for a cached copy. 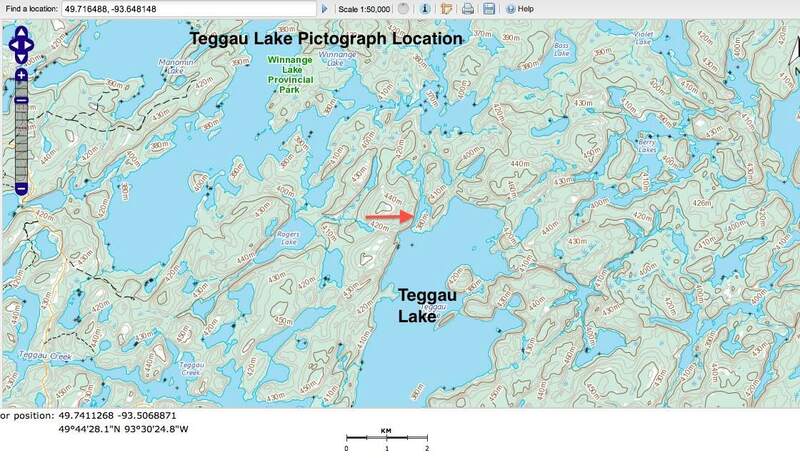 Jeff’s Temagami map (Central) has the site indicated. Mattawa River (Porte de l”Enfer) – cave site with exposed hematite veins. 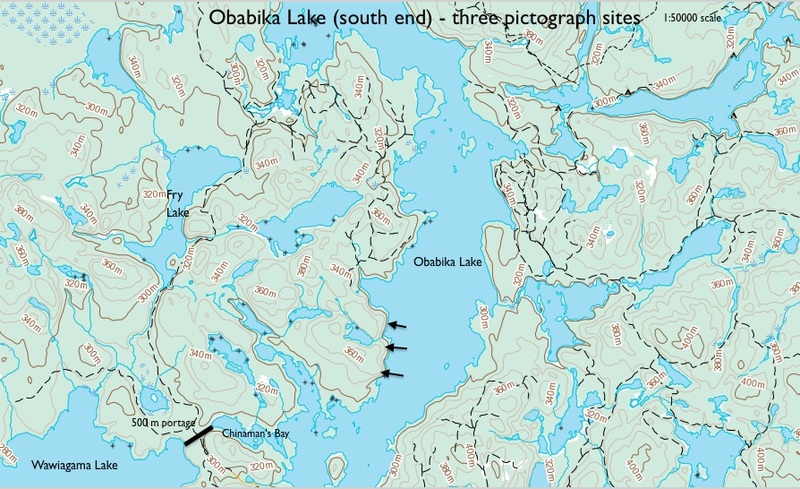 The Anishinaabe Pictograph Sites of Missinaibi Lake. 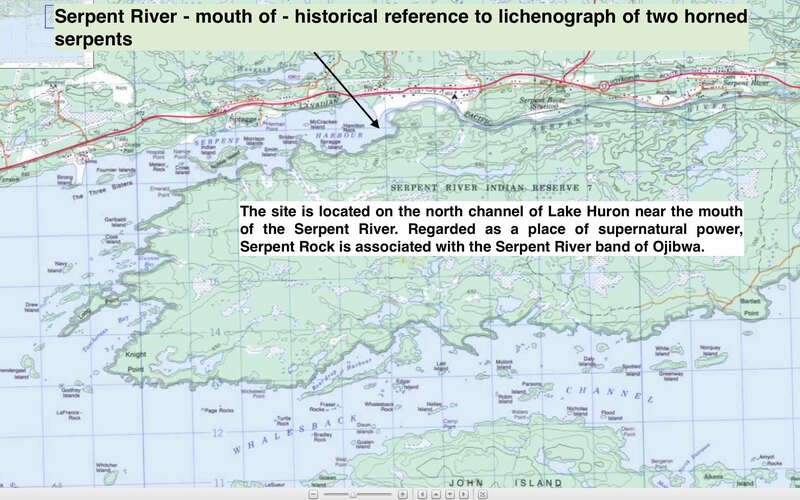 Serpent River – mouth of. Not a pictograph site but two horned serpent figures created by scratching away the black lichen. First reported in 1800 by fur trader Daniel Harmon. See Thor Conway article here in Arch Notes 1985 (March/April issue). 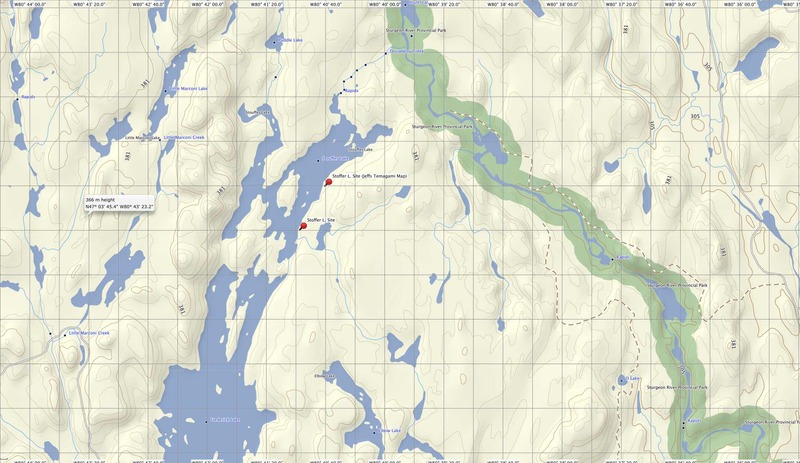 Stoffer Lake (Temagami) – one or two sites on the east side of the lake. See here for the Ottertooth map which locates a site tot he south of the large island; Brian Back write-up of the site here. 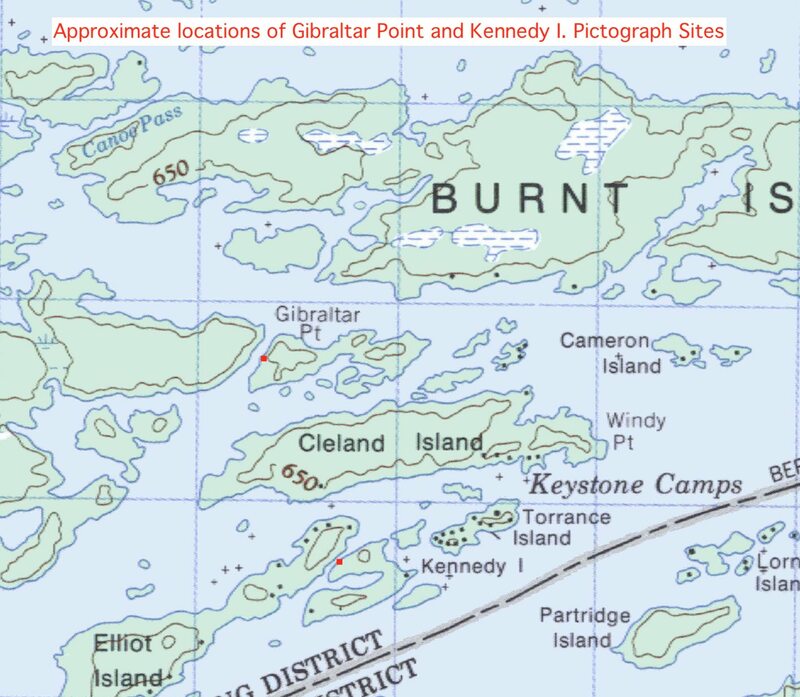 See here for Jeff’s Map site situated across from the northern tip of the large island. 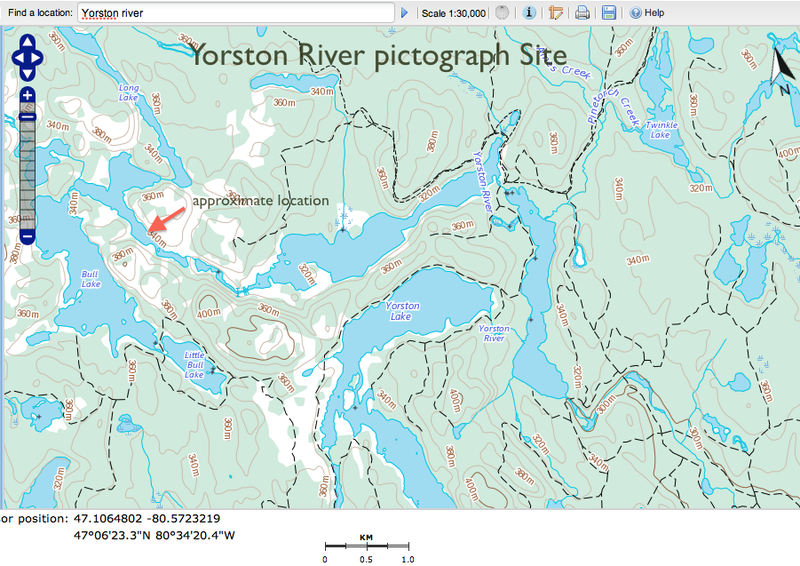 Spanish River (Ninth Lake) – pictographs here. Thor Conway’s Discovering Rock Art (2016) has a chapter on this site. He discusses 17 images in three different groupings, including the central panel pictured above with its Thunderbird, vertical line, series of five dots, snake, and perhaps an animal image above the canoe with the unusual Y-shaped figure in the middle. 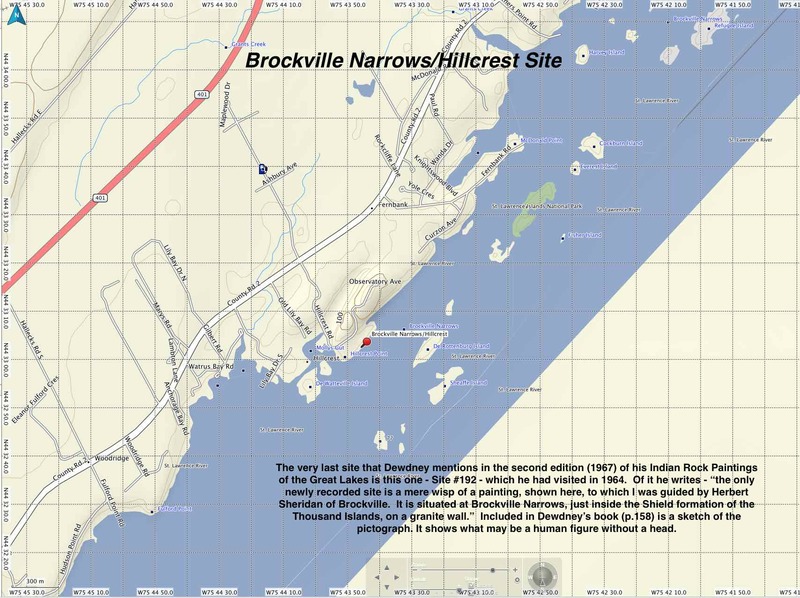 Brockville – two very minor sites, one in Brockville – the Fulford Site – and the other 7 km up the St. Lawrence at Brockville Narrows/Hillcrest. 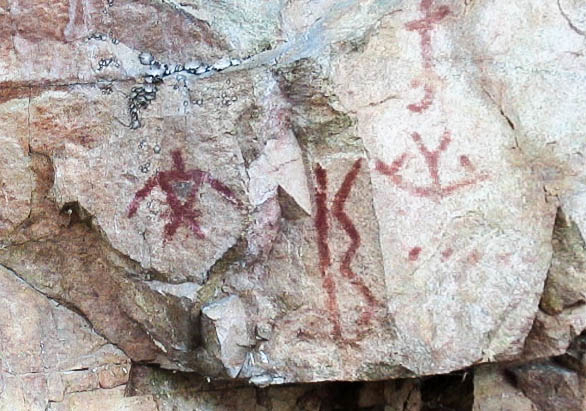 See here for Herb Sheridan’s brief article on the Brockville pictographs. He is the one who showed Dewdney the Brockville Narrows site back in 1964. 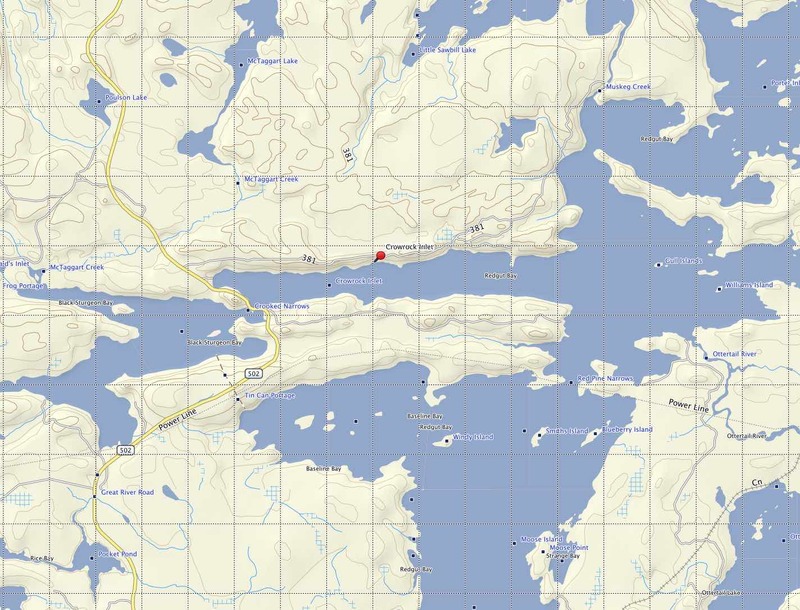 Grand Lake (Algonquin Park) – also here for an image and discussion; site sometimes referred to as Carcajou Bay. Topo Map view here or here for a view in Jeff’s Map. 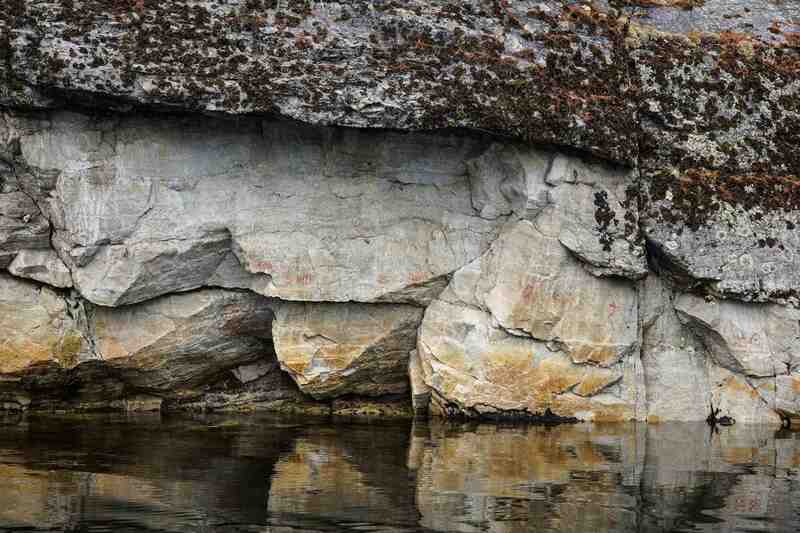 Mazinaw Rock – Dewdney’s Face II – canoe and a Mishipeshu figure or two? Mazinaw Lake (Bon Echo) – See pp 95-100 of Selwyn Dewdney here for a description. A pdf file just of the five pages can be downloaded here. In May of 2015, my brother and I spent a couple of days on Mazinaw Lake. 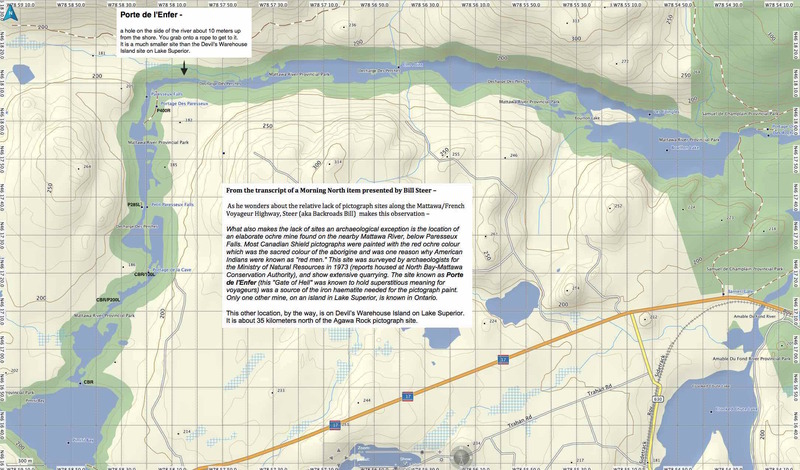 We’ve created a post with pix, maps, and sketches which provide a comprehensive guide to the site. 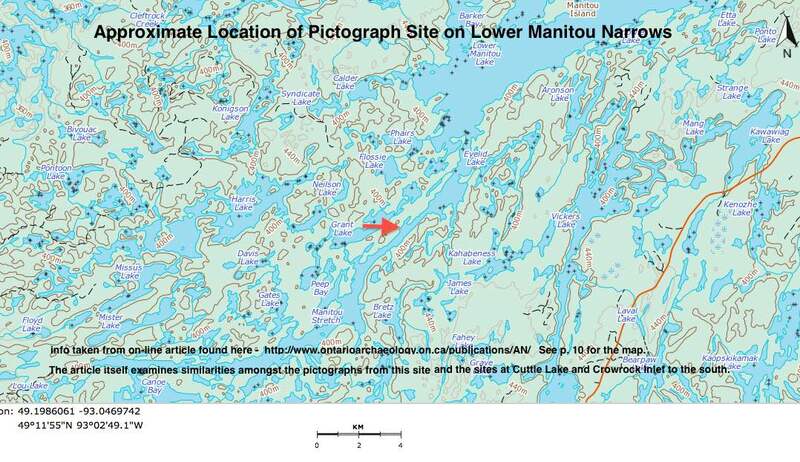 Click here to access The Pictographs of Mazinaw Rock: Listening For Algonquian Echoes. 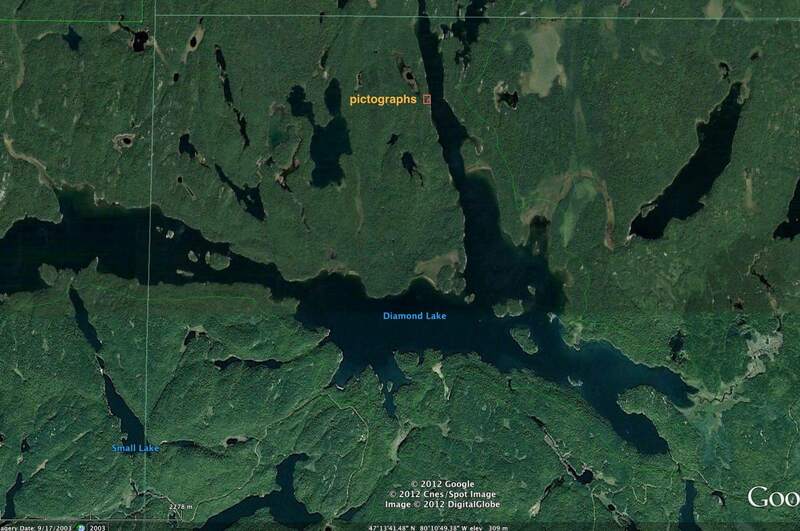 See also Lower Mazinaw Lake and its four faces. Click here for a few pix and a map. 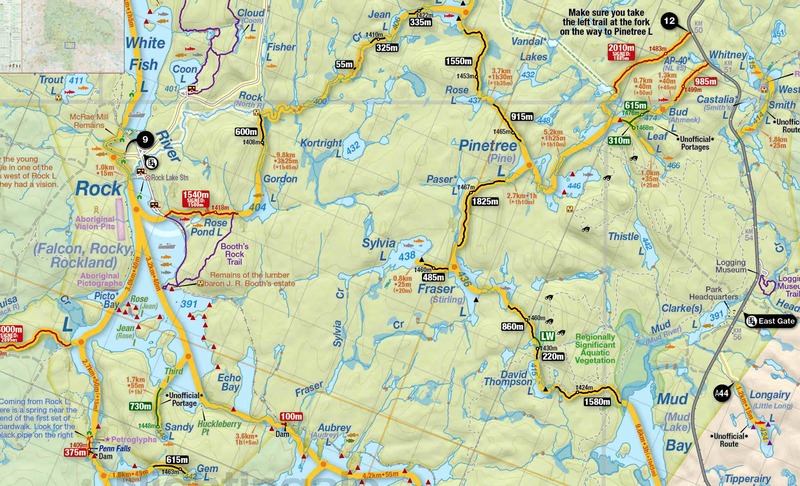 Rock Lake (Algonquin Provincial Park)– A 720 kb pdf file with maps and info from various sources can be accessed here. For a Bill Mason painting of the pictograph site cliffs see here. 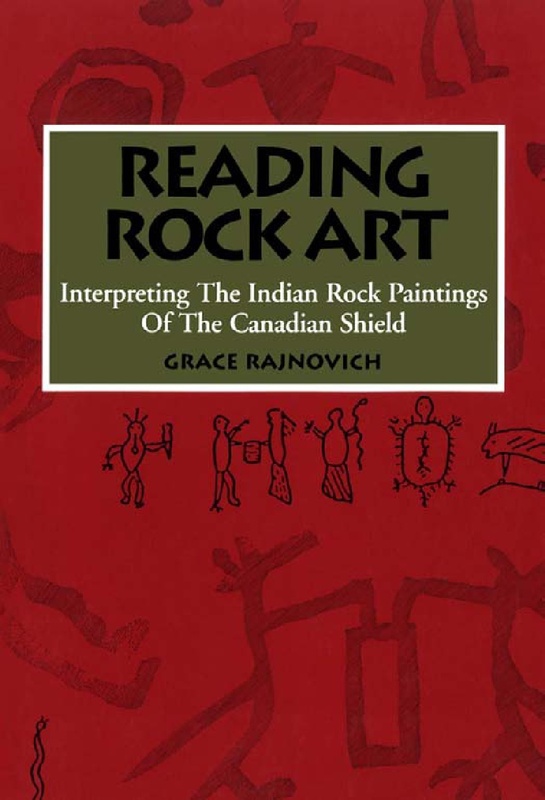 To get a handle on the meaning of the pictographs and the motivation of those who drew them on the stone Reading Rock Art by Grace Rajnovich is your best bet. I ordered my paper copy from Amazon in mid-2013. It is also available as a digital download. An 2008 article entitled Des peintures et des offrandes: Recherches récentes en art rupestre de l’Ontario by Serge Lemaitre and Valerie Decart is available on the érudit website. 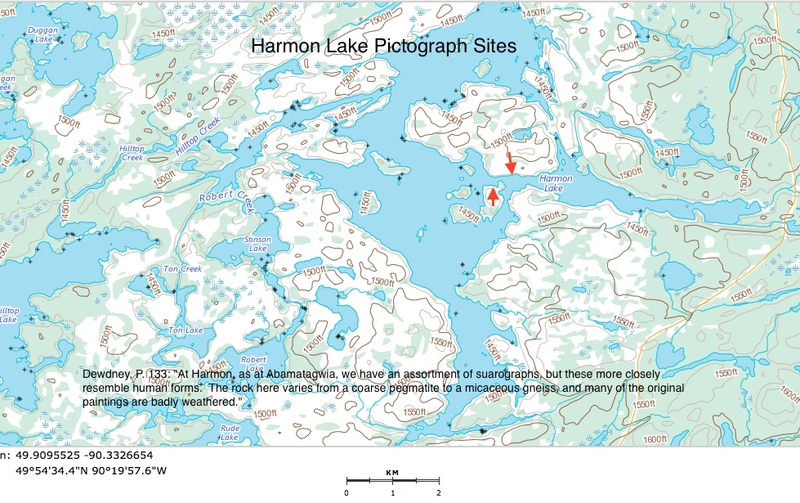 Click here to read their study of pictographs based on the following Ontario sites stretching from Lake Nipigon to the Quebec/Ontario border – the Nipigon River; Worthington Bay; Devil’s Warehouse Island; Upper Grassy Lake; Gros Cap; Chiblow Lake; Lake Temagami; and Matachewan Lake.Click here for a Google map of the various locations. 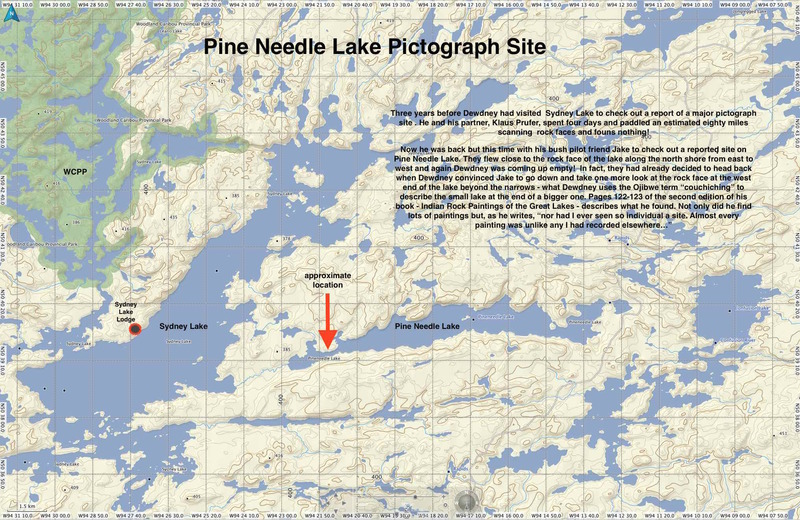 In respect of the values and beliefs of the Elders of Lac La Croix First Nation related to the sacred nature of native pictographs, The Quetico Foundation has agreed to remove all photographic images of the pictographs from our Web site. 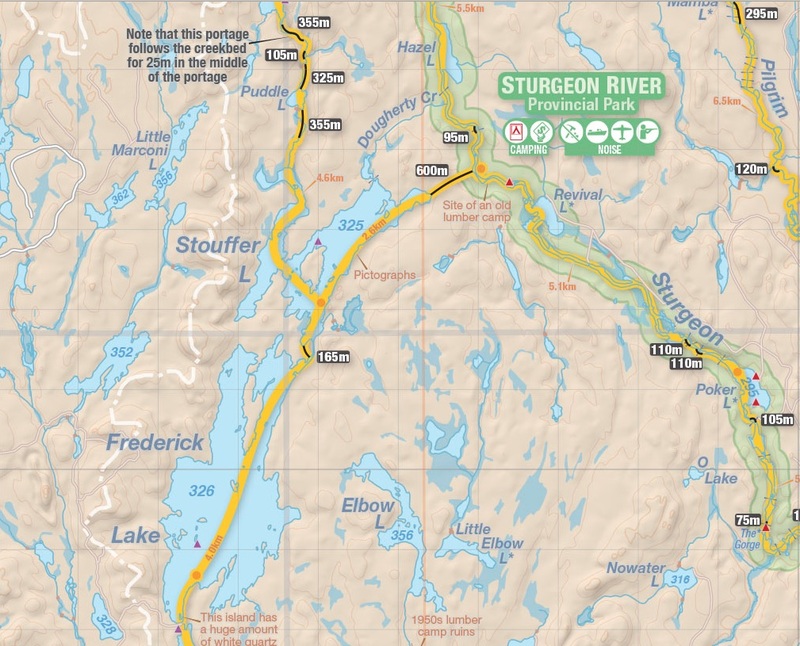 In addition, as Foundation publications such as our Canoe Routes Map and brochure are updated and reprinted pictograph photographs will be removed. 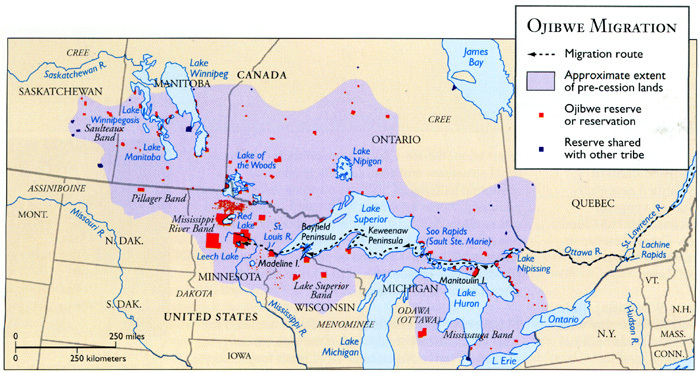 Aboriginal peoples have lived in this region for thousands of years. 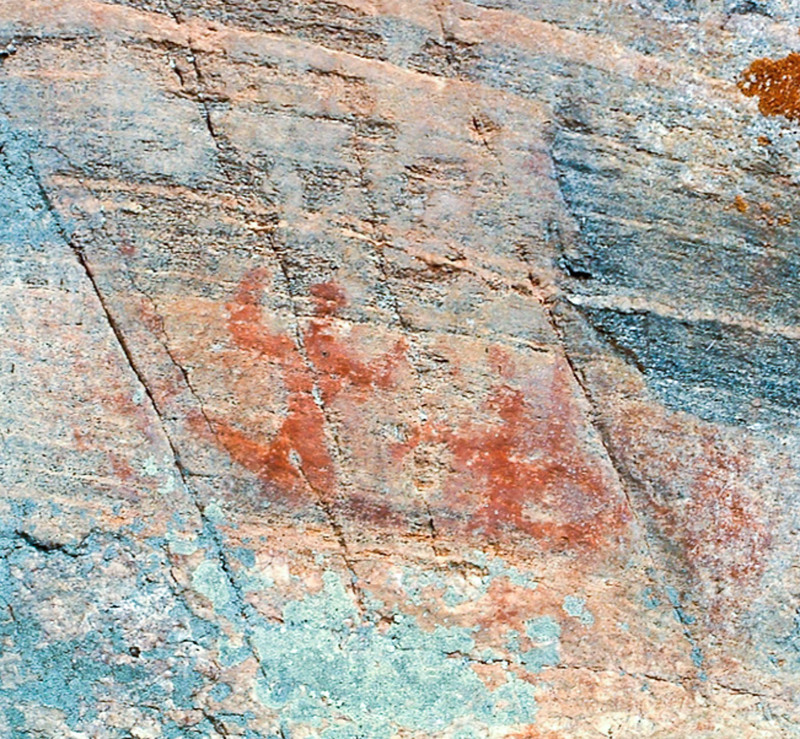 In fact, 28 Aboriginal pictographs can still be sighted in the Park. 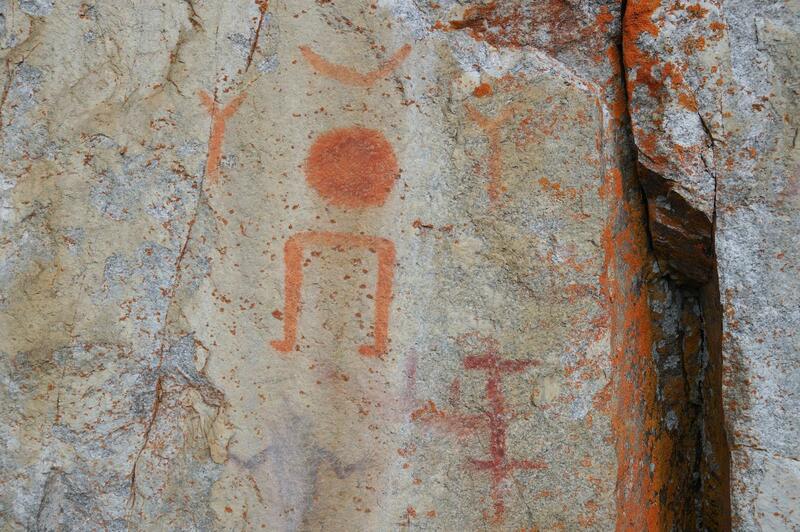 For many Anishinaabe at Lac La Croix, these pictographs and their locations are sacred. To protect and respect this land, we’re deeply honored to work with and learn from the Lac La Croix First Nation. While we are told how honoured the foundation is to work with the La Croix First Nation, the rewrite has deleted the “how”. Note also the reference to 28 pictographs; it should read “28 pictograph sites” since many of the sites have more than one pictograph. And while aboriginals may well have lived in the area for thousands of years, the consensus is that the Anishinaabe arrived perhaps three to five hundred years ago and displaced people who previously lived there. 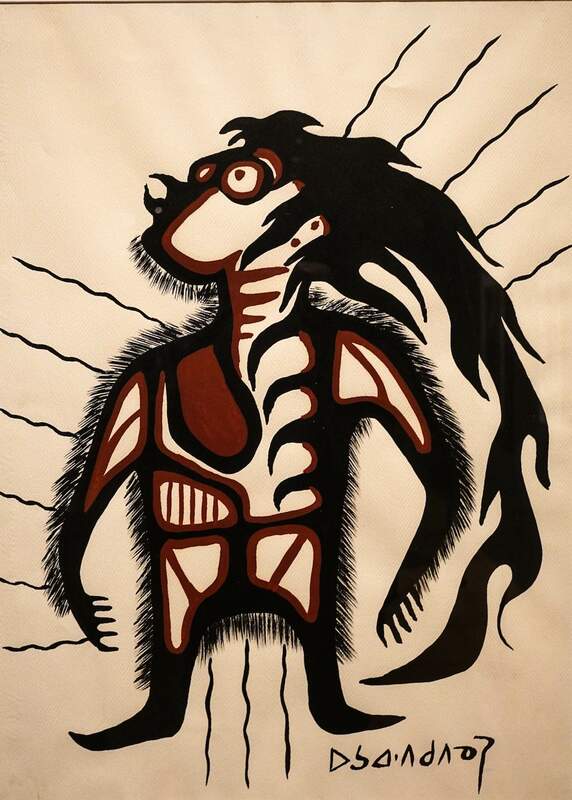 The misguided Quetico Foundation approach is based on the same attitude that would have shut Norval Morrisseau down before he was able to develop into one of Canada’s great artists by drawing from his Anishinaabe cultural heritage. You’ve just got to laugh when you realize that it was for the Quetico Foundation that University of Toronto Press published Dewdney’s book which established the systematic study of those pictographs! 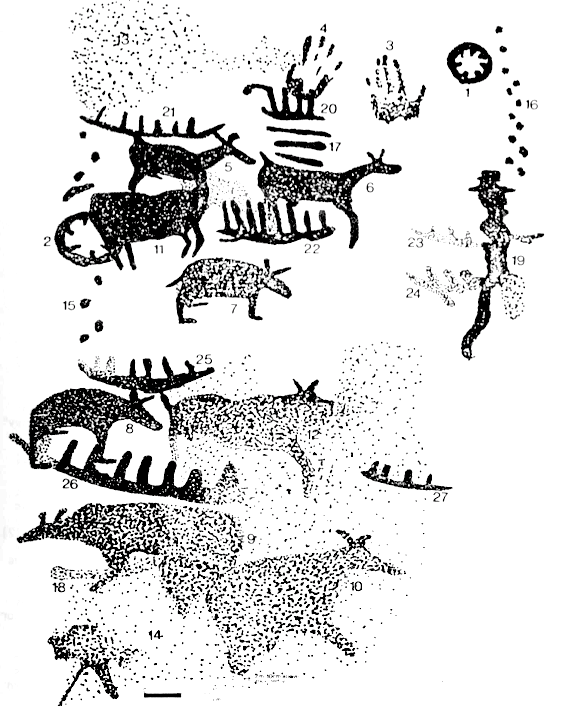 We would know very little of these entry points to Anishinaabe culture were it not for the efforts to catalogue and analyze and understand the pictographs by the many people listed here. An essential part of the study involves getting a visual record – i.e. sketching and taking photographs. In a few generations, these images will be all that is left to contemplate as the already-smeared and fading pictographs are gone forever. I recently upped a post entitled Selwyn Dewdney, Norval Morrisseau and the Ojibway Pictograph Tradition. You may find it of interest in relation to the debate about whether pictographs – or aspects of Anishinaabe culture in general – should be shared with outsiders. This entry was posted in Pictographs of the Canadian Shield and tagged aboriginal pictographs Ontario, Agawa Rock pictographs, Algonquin rock paintings, Anishinaabeg art, Before and After the Horizon - anishinaabe pictographs, Bloodvein rock paintings, Bon Echo pictographs, Cliff Lake rock paintings, Diamond Lake pictographs, First Nations paintings, Lake of the Woods pictographs, Missinaibi rock paintings, native rock paintings Ontario, Obabika rock paintings, Ojibway rock paintings, Quetico master map pictographs, Quetico rock paintings, Temagami rock paintings. Bookmark the permalink. I’ve seen the Pics on the shoreline rock at Jackfish Lake, NW of Fort Frances, I was looking for history of the art when I found your page. Beautiful. Dave, there are so many sites listed that I myself have never been to that I had to check to see if Jackfish Lake was there! 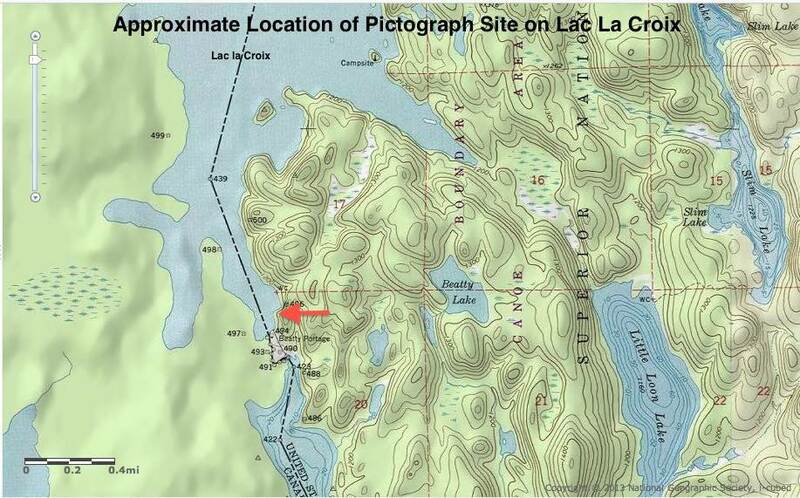 I notice that I have not even provided a map of the lake, let alone the location of the pictographs on the lake. I’ll provide a link to a map soon. In the meanwhile, if you’ve got any photos of the pictos you’d like to share, I’d be happy to include them in my post! 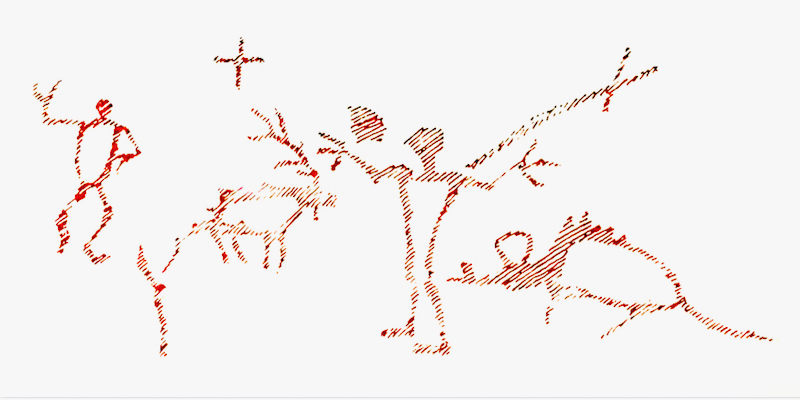 Thanks for looking – it has only been a year since I immersed myself in the topic of the rock paintings. 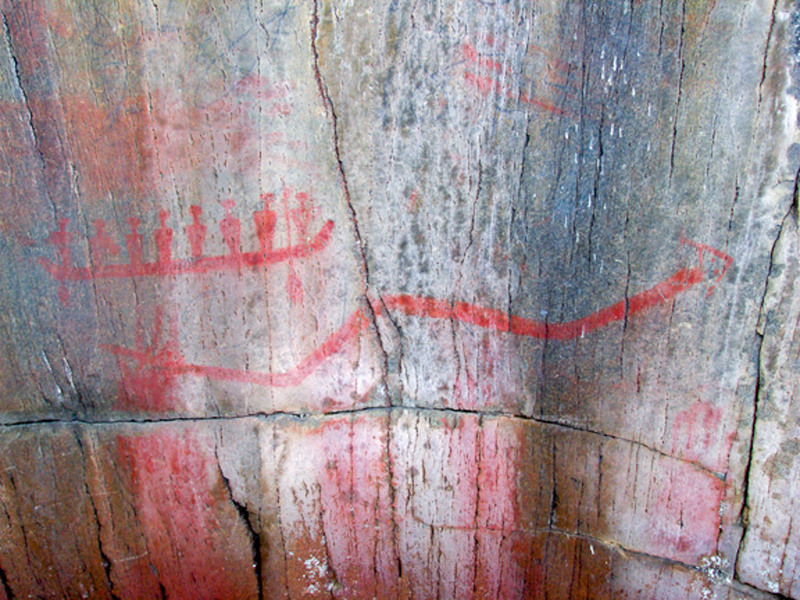 It has provided another motivation to slip that canoe into some river in northern Ontario and see more of the pictographs myself. This summer my bro and I are paddling down the Bloodvein River from Red lake to Lake Winnipeg; one of the highlights will be the dozen Ojibwe rock painting sites we will paddle by. Wabauskang Lake in N.W. Ontario has pictographs that aren’t listed and which only a few people probably know about. I just did a search for Wabauskang Lake and came up empty. I did take the “u” out and came up with Wabaskang Lake, which fits the bill. It is on the road to Red Lake near Perrault Falls. If you have an exact location, let me know and I can add it to the map. Thanks again for your interest and for taking the time to share your knowledge. Have you seen the ones on the Winnipeg River near Eagle Bay Road? Loneranger, Thanks for the heads up. 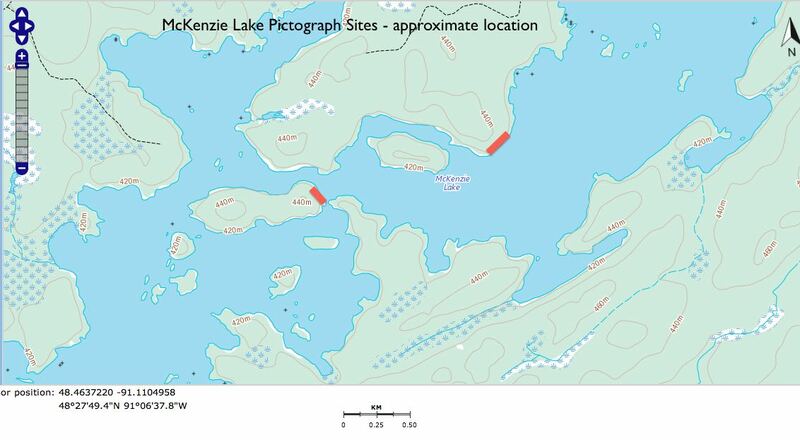 Are you referring to the Kenora area in your reference to the Winnipeg River near Eagle Bay Road? Since I only started obsessing about pictographs about a year ago, I have not really seen all that many of them. Cliff Lake above Lake Nipigon last summer was the most impressive site I have seen so far. 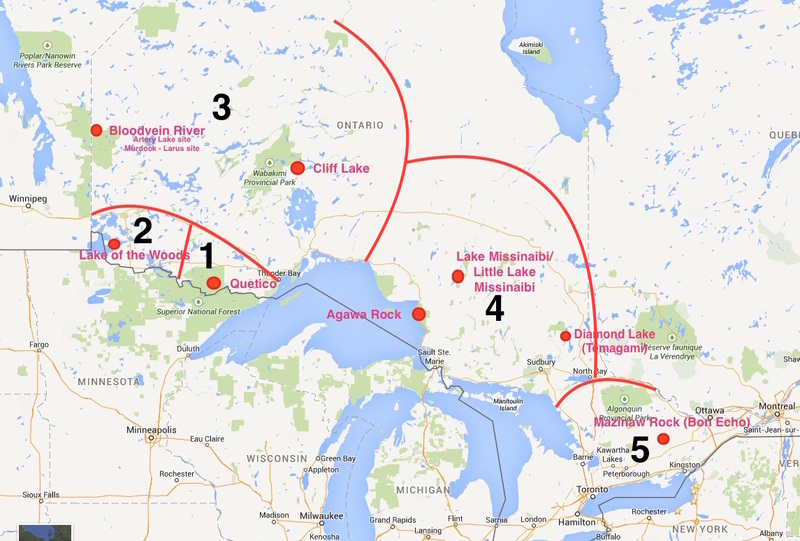 This summer my brother and I are paddling the Bloodvein from Red Lake to Lake Winnipeg and expect to visit a dozen pictograph sites. As for the one you mention, if you’ve got a pic you’d be willing to share – or a more exact location – send it this way and I will insert in the post. 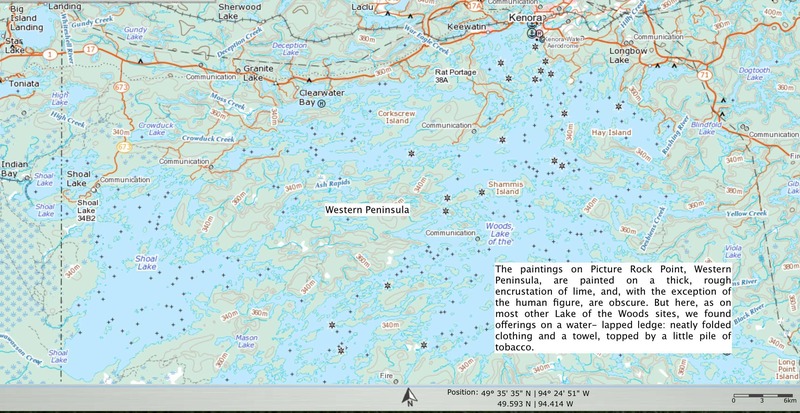 I will email you some pictures we took of the paintings when I return to Kenora ontario in the spring of 2015..Your map doesn’t show the correct location..The paintings are due North of Brown’s island on a protected historical site. Sounds good. I’ll be happy to post the pix when you email them. I did check out the topo and found brown’s island. Send me the correct location if you want and I’ll correct it. I have a b&w photo from The Royal Ontario Museum, Toronto of a pictograph from Burditt Lake and would like to send it to you to see if you have a color pix or know where it is located. 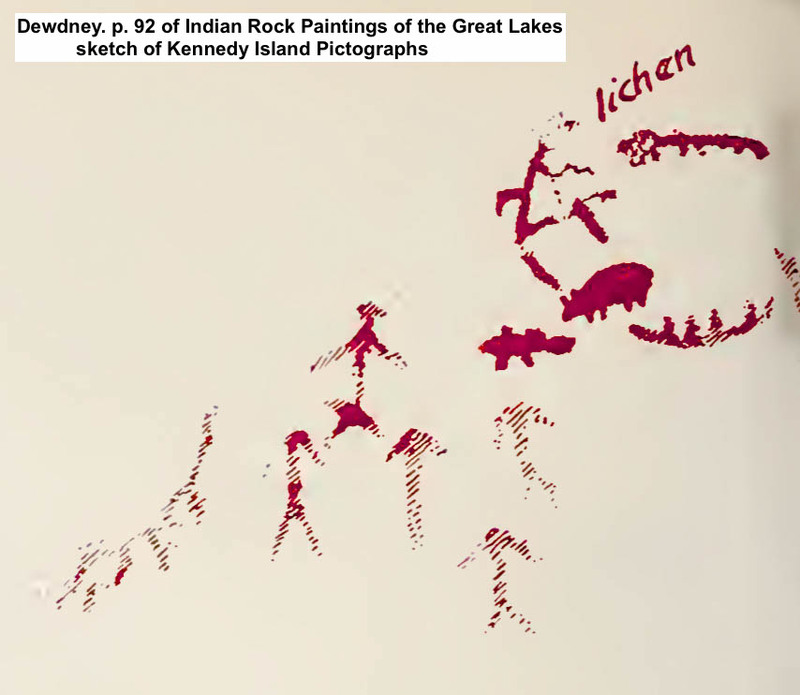 Bill, I looked the Dewdney’s 1962 edition of Indian Rock Paintings of the Great Lakes (https://archive.org/details/indianrockpainti00dewd) and Burditt Lake is not mentioned. It is possible that the second edition of his work (1967) includes a description of the site but I do not have a copy of that book available. Re: sending the image to me. What you might do is take a digital photo of it and send the jpg file to true_north@mac.com I certainly would like to see it! Chances are it is a copy of a photo taken by Dewdney. I will do a bit of research on Burditt lake and see what I can come up with. Ed, lots of stuff to see for sure. I am still going through Dewdney’s book and adding sites. Our recent visit to Mazinaw Rock and Petroglyphs Park gave us even more to look at. Hopefully this summer you’ll get a chance to visit one or two of the sites too! Ah – the Rajnovitch book I’ve got! I’ll dig it out and take a look. 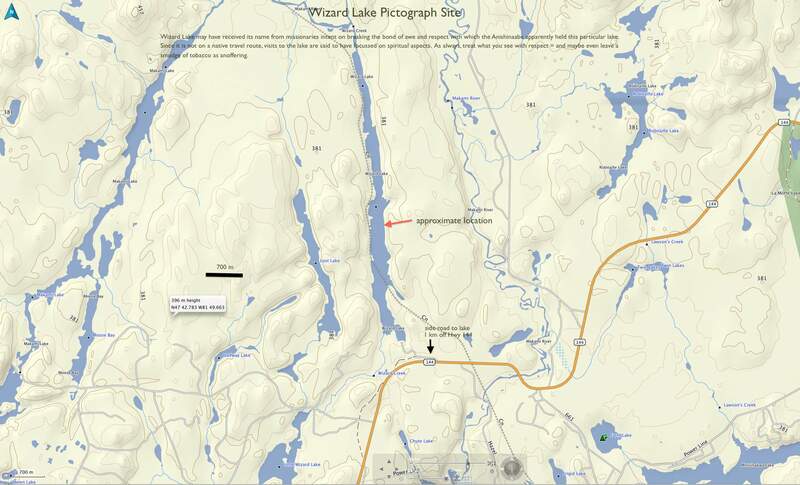 She may also have written an article about the Burditt Lake site which will provide more info. 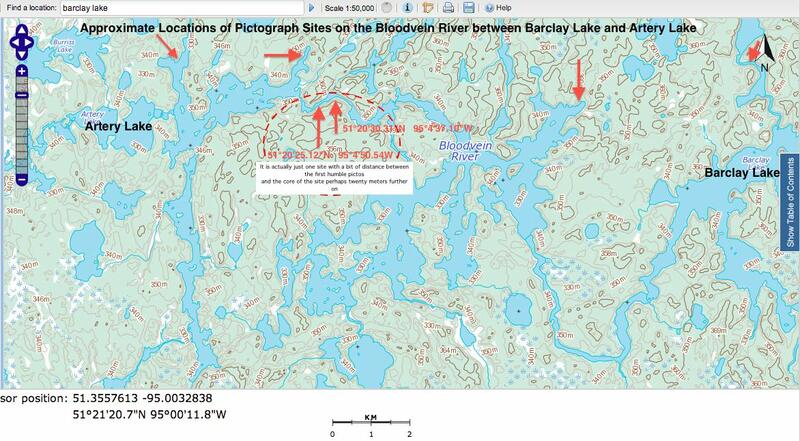 Bill, I just googled Burditt Lake and got a reference to my own post on the pictographs of Ontario! Huh? So I went back and there it was – clearly I have not had enough coffee yet! 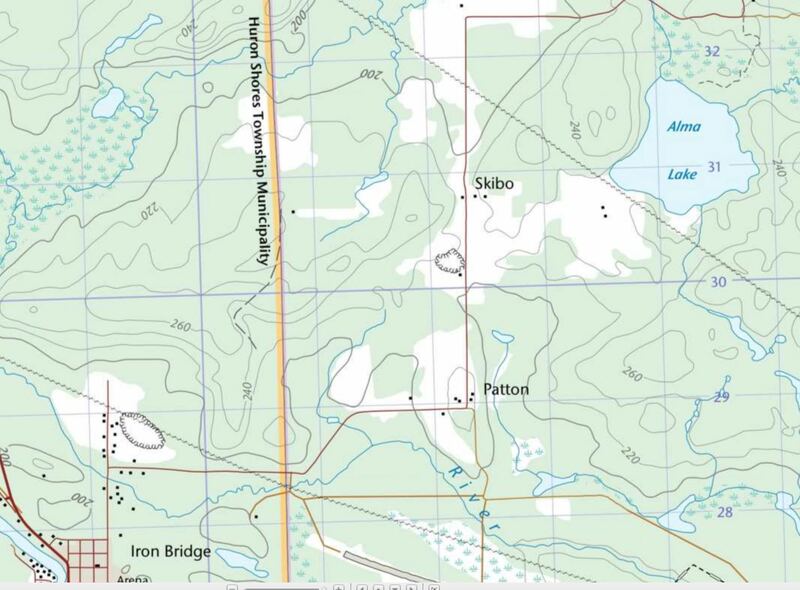 Burditt Lake is indeed listed and there is a map but no exact location known (to me). I’ll see what else I can find. The lake is about 12 kilometres from end to end – a lot of shoreline! My wife. my son and myself started collecting photos of pictos a few years back. We’ve been to several lakes and have come across many pics not mentioned anywhere that we can see. Two lakes for sure and one that is mentioned but we found several pics not mentioned. One my son spotted about 30 or so feet up a cliff which he climbed and took a fantastic photo of and we’ve been looking and wondering what to do with it (them). Tom, you’ve had good luck in paddling by these pictographs unknown to others. 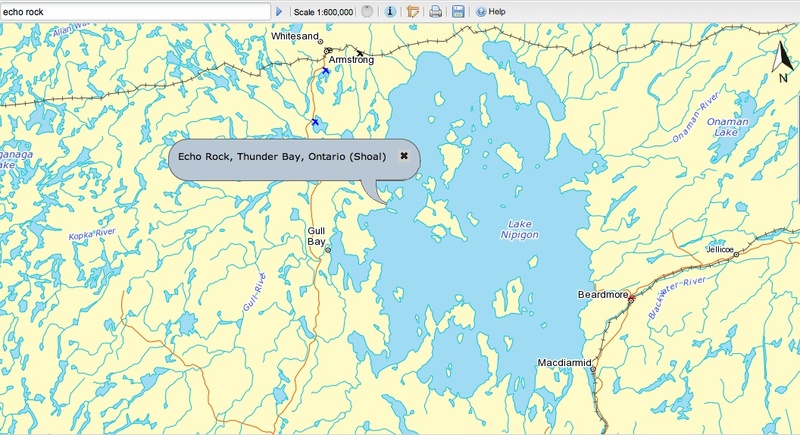 I am assuming that they are located here in Ontario though you provide no specific lake names or pictograph descriptions! Perhaps you wish to keep the knowledge of the various sites to yourself – nothing wrong with that. This will allow other people in years to come to experience the same thrill of stumbling upon something known to a few. 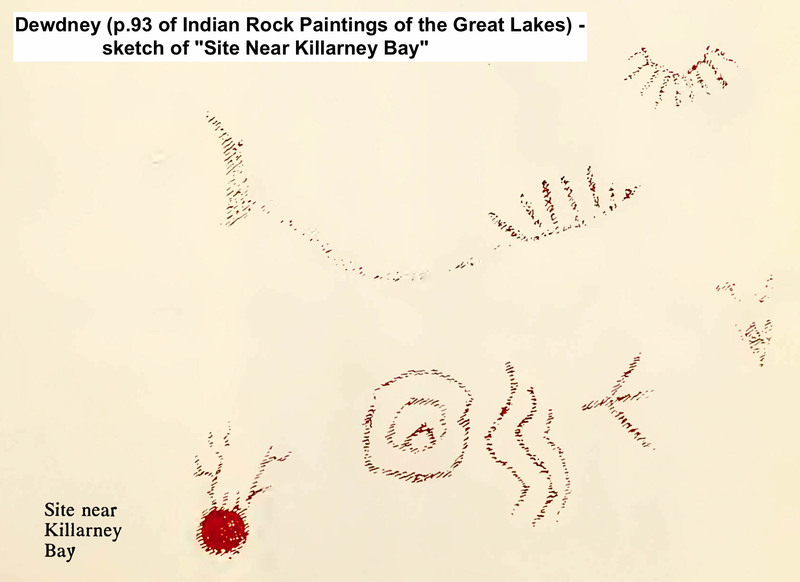 If you haven’t already, check out Selwyn Dewdney’s Indian Rock Paintings of the Great Lakes – the second edition – for the most complete treatment of Ontario pictographs. The book is fifty years old but contains most of them. Your picto sites may be included in his list. 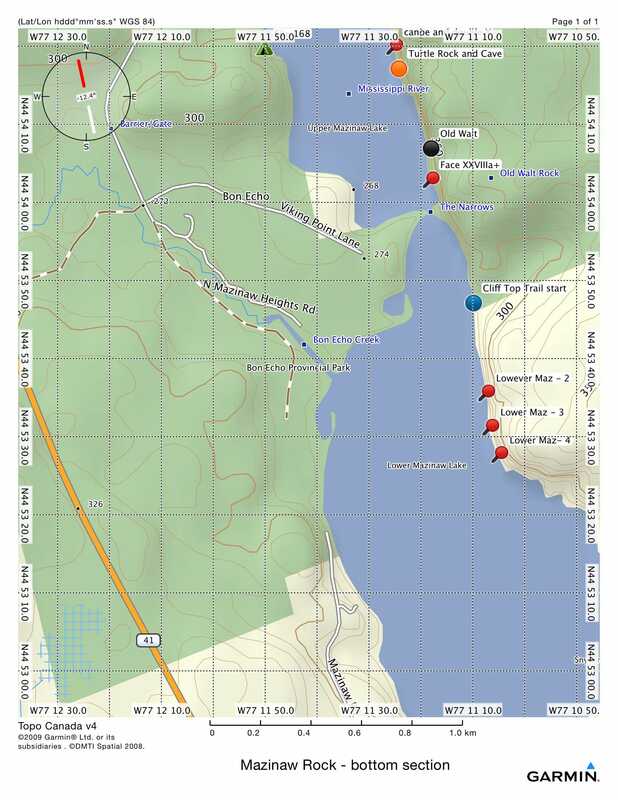 You could do what I have done and create a post with the images and perhaps even the locations so that fellow paddlers will have a heads up on what side of the river or lake to paddle down. You note that you “could go on and on” – creating a post would provide you with the platform to do so! If you want to send me the digital images, I could incorporate them into my post on Ontario pictos, with or without the locations and with or without credit being given – your choice. I could even help you set up a WordPress post in your name if you want. 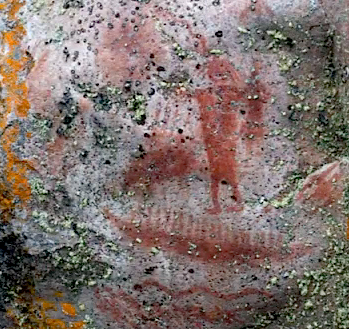 Thanks – It is always good to hear from someone taken by the Anishinaabe ochre images and marks they paddle by. They are located on the north side of the river in two sections. For about two decades we always thought it was just a discoloration of the rock, until we got close up and clearly saw the hand print. Keep in mind, a majority of it is heavily chipped, which makes me wonder how old it might be. I’ve tried to find other references to these pictographs and haven’t come across any yet. If you know of anything you can direct me to or their meaning, please let me know. I’m happy to talk further if you’d like also. 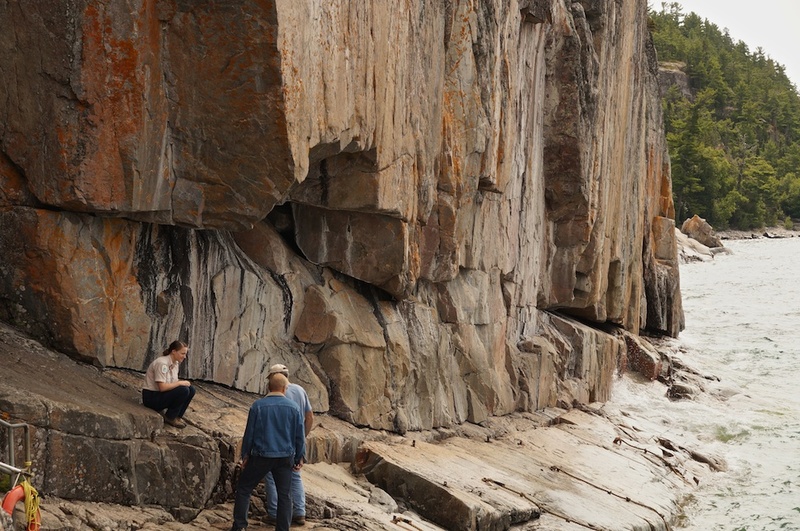 Have you seen the pictos at Pictured Lake, outside of Thunder Bay? I would be happy to take you and your brother as thanks for your wonderful trip reports. Tom, thanks for the offer! I’ve never been to that particular site – or to most of the ones I’ve catalogued! My obsession only dates back four years! 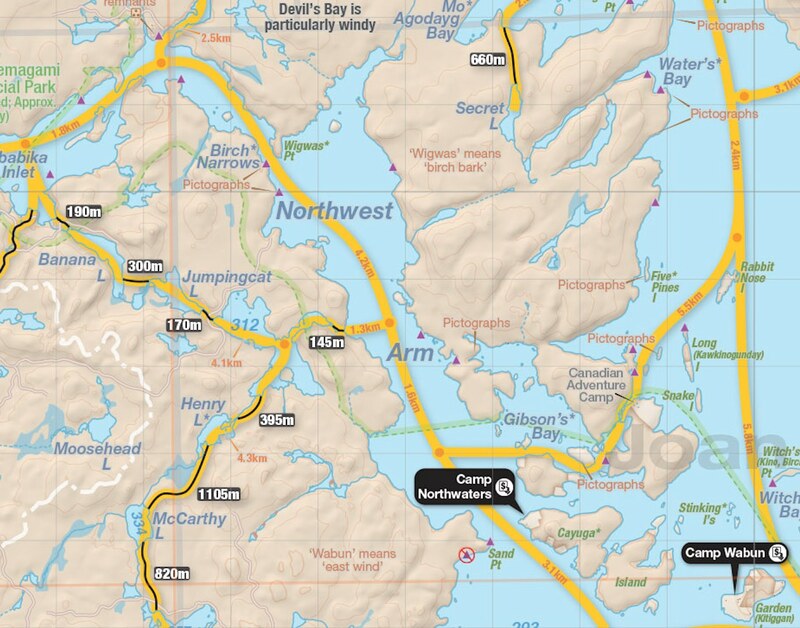 If you live in or near T’Bay you are on the doorstep of some incredible canoeing possibilities. We’ve done the 18-hour drive up from T.O. five times in the past seven years! Maybe we passed you on the highway as you were driving to Temagami or Algonquin Park for your canoe trip! 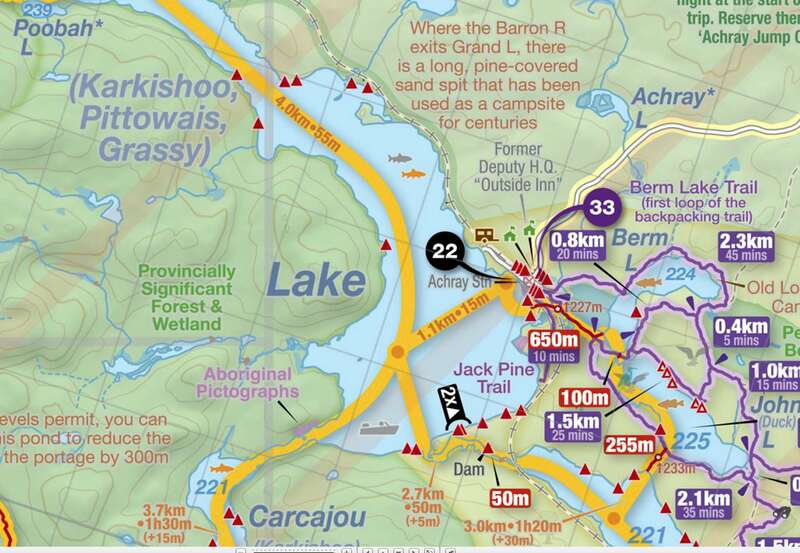 Our bit of the Canadian Shield does not lack for canoe tripping choice! 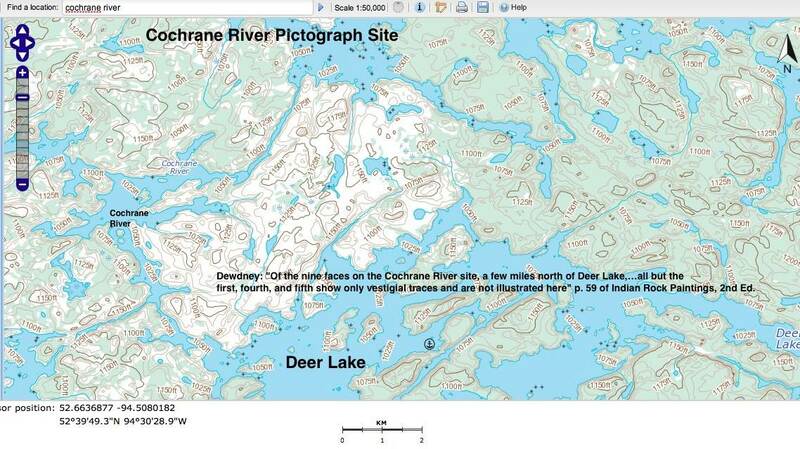 The Pictured Lake site is the one that provided Selwyn Dewdney with the front cover of his book! If you’ve got any photos you’d be willing to let me use in my pictograph post, let me know! I will gladly send you some pictures of the Pictured Lake site as soon as I get out there again. Lake Superior is open, but the inland lakes are still froze solid! I’ve been canoe tripping for only a few years and have been lucky to have already done the Steel (twice), Kopka, Black Sturgeon (twice), as well as many smaller, less-known rivers. This year will hopefully have us on the Gull (not in Minden) and the Bloodvein. We are definitely very fortunate to have all of these rivers so close to home. It sure makes the shuttling a lot easier. It was his excellent write-ups that first got me doing up one of our canoe trips back in 2010 though I still haven’t managed to do them quite like he does! Are you going to paddle right into Gull Bay? I ask because I understand that thee some pictograph sites out there – and maybe on the river too. Echo Rock sounds like a dramatic spot to paddle by. My bro and I are revisiting the Fairy Point pictographs on Missinaibi Lake after paddling down Little Missinaibi Lake and checking out the rock painting sites there. We figure to spend nine or ten days including the ride up from southern Ontario and back. Happy paddling! We’ll compare notes at the end of the season! 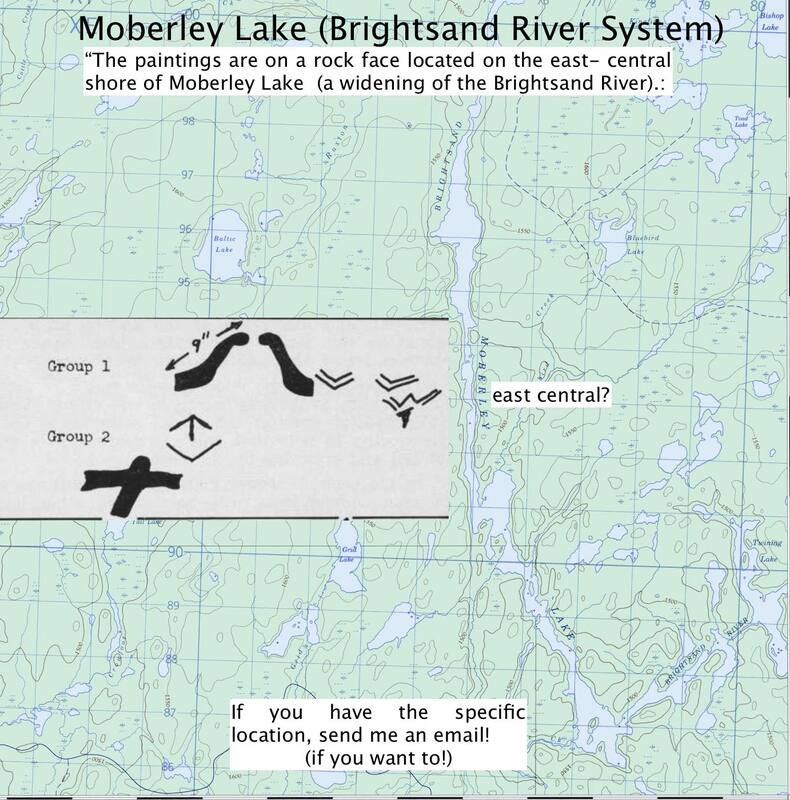 Dear “Ramblin’ Boy”, I only discovered your wonderful site, in the recent past, when I began my research on the pictographs at Fairy Point on Missinaibi Lake in the Chapleau Crown Game Reserve. Garry, your Missinaibi memories go back a bit further than mine – by a decade and more! I hope you have been back for a return visit in the meanwhile. As requested, I’ll send you an email! I’m just happy that I can remember that far back!! I’ve returned on 3 occasions…1975 & 1976 are two of them…still searching the catacombs for the 3rd date!! lol That was the best summer of my life…bar none!